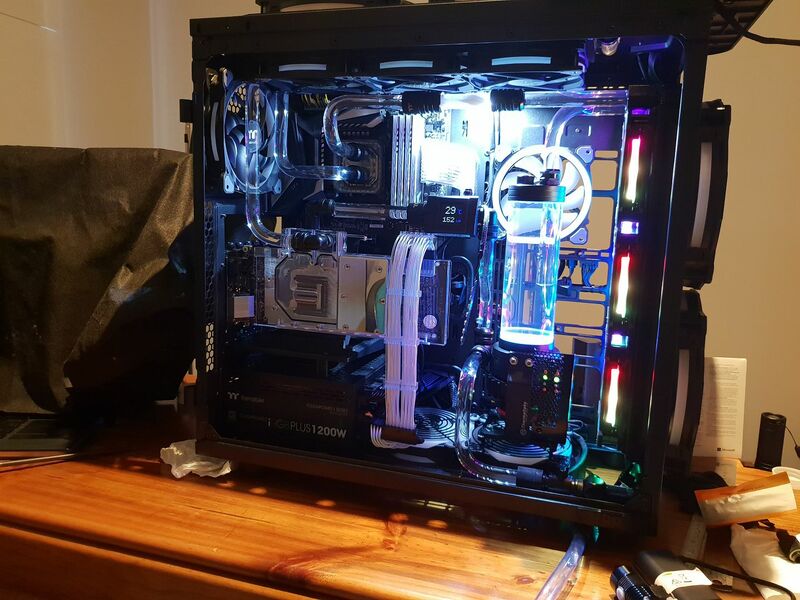 The old rig with Z97 and i5 4690K running AIO cooler was getting a bit dated at 4 years old. 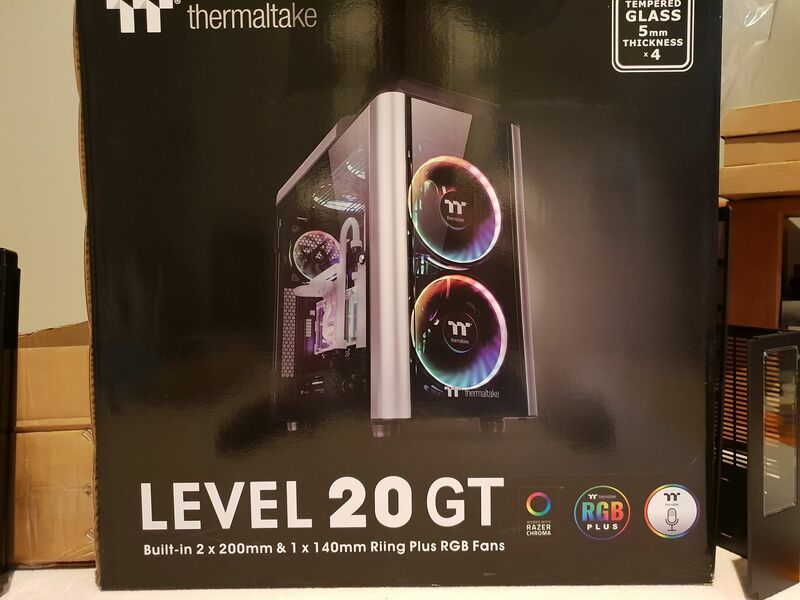 As I dont know how long the AIO cooler will last and VR is pushing the 4690K a bit it was time for an upgrade. Walked into Centercom and there is the Level 20 GT plus sitting on the floor in front of me in a very big box. 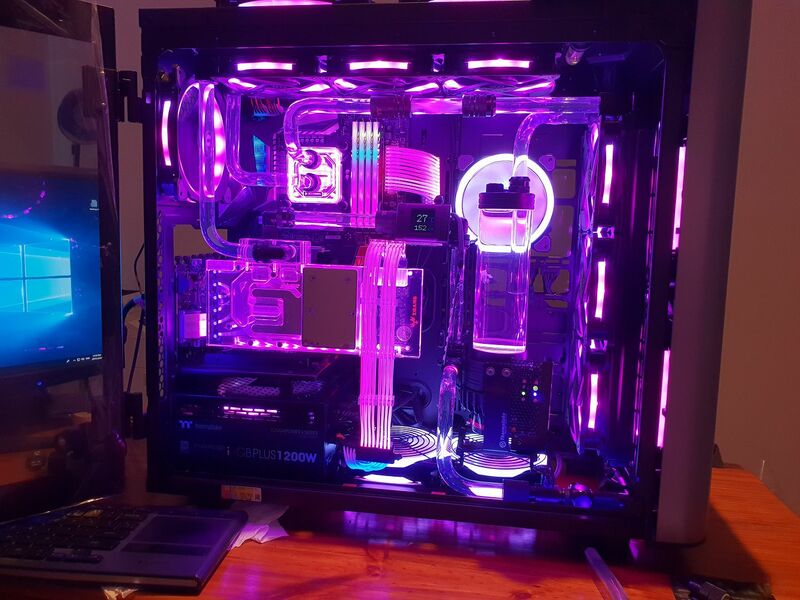 The 200mm ARGB fans got me, as its such a nice case thought I might as well go all out with ARGB everywhere and its perfect for my first open loop which might as well be nuts as well. Heaps of G1/4 fittings, extenders, adapters, couplers and plugs. Turned out to be quite a list in the end which has been sourced through Centercom Bundoora, TT Direct and ebay. Just a little bit of TT stuff....thought I would keep the theme. 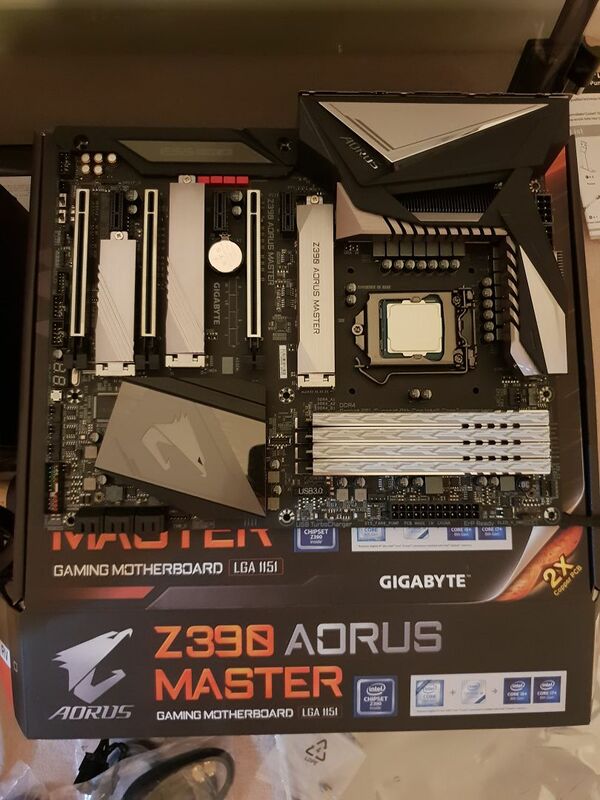 Aorus Master....couldnt wait for the extreme water cooled version and besides this cost more than the processor, which is a first for me, didn't want to know what the extreme will cost. Edit: Motherboard, processor, memory and Evo HDD were tested to bios with a heatsink and fan to verify these parts were ok before any assembly commenced. As the case, leads, motherboard and mostly everything else is black I decided to make everything where possible...black thus Ebony Bliss also as everyone else gives their build blog a name so will I.
Thats a lot of black so Its going to need balls of RGB lighting to even see it. 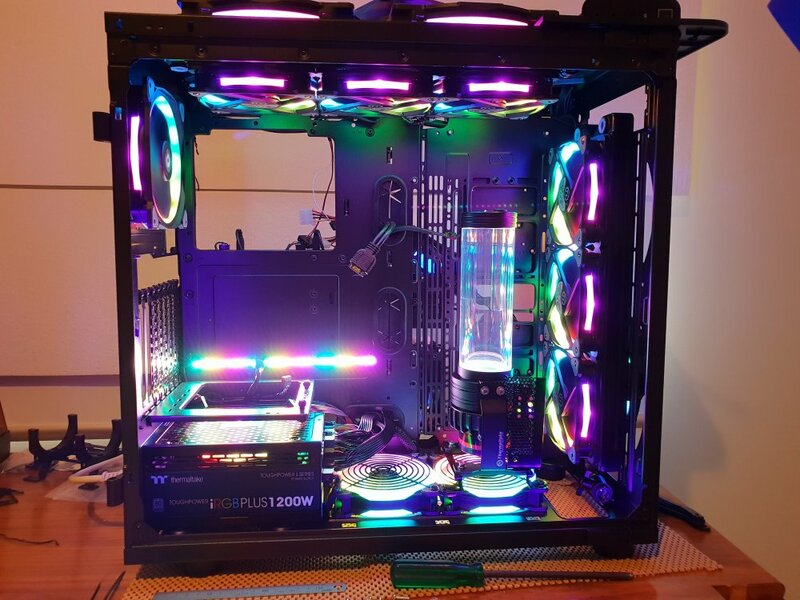 Bring on the 13 Riing fans and other RGB parts listed above. Ive also included ARGB strips under the front and lower edges of the motherboard adapted to use the TT Controller plugs. 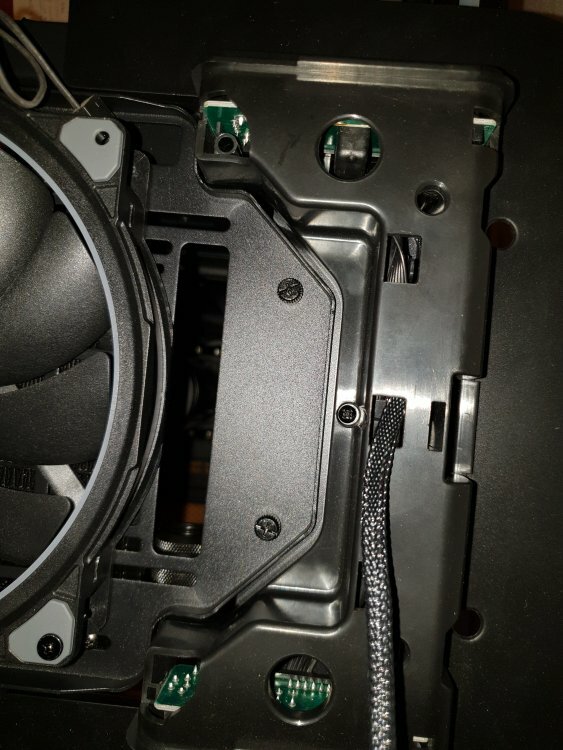 The CPU and GPU blocks both have ARGB strips also adapted to TT plugs along with the Strimmer leads. 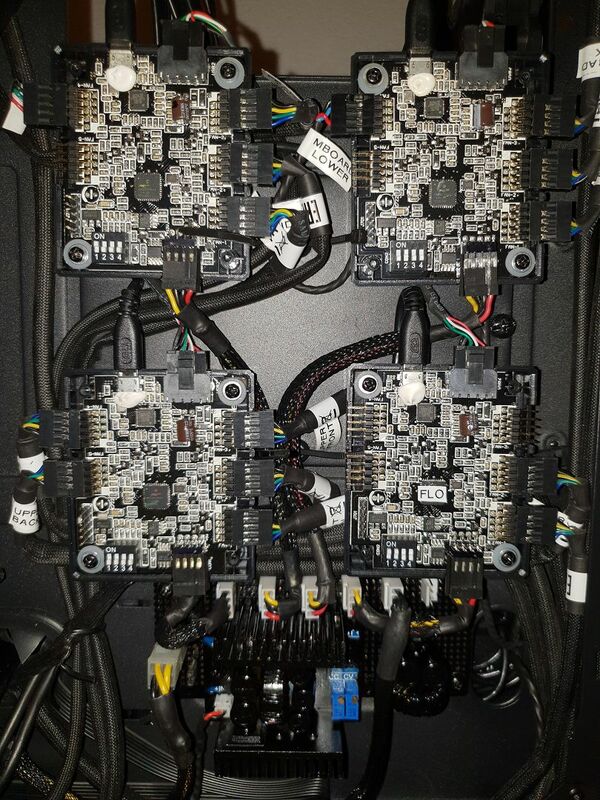 All this RGB requires power and a lot of it, my calculations averaged around 10A @ 5V and I've added to that. While the TT power supply can deliver 30A @ 5V getting 10A out of it with Molex plugs gets messy plus I didnt want to deny the motherboard any current so a power distribution rethink was required. 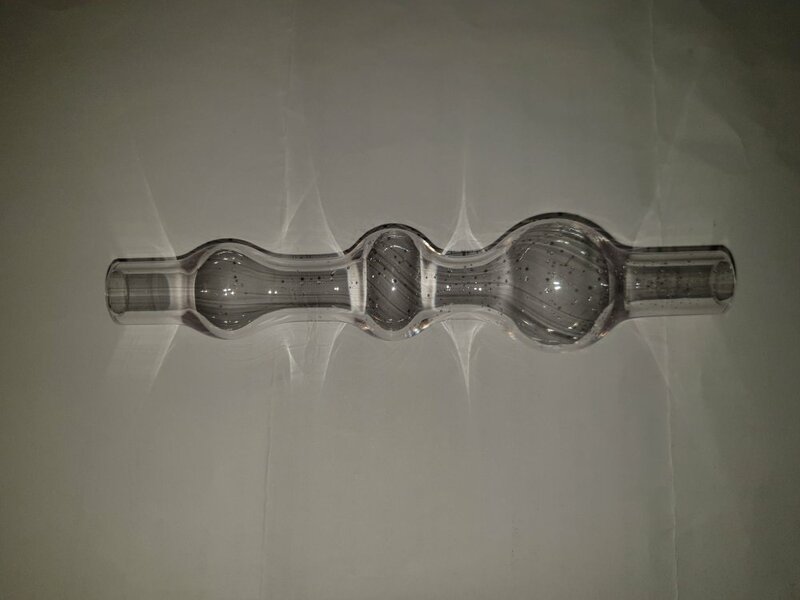 The UV concentrate looks excellent....suppose it will need UV lighting then. Bring on the cold cathode 300mm tube hidden down back edge of front radiator plus UV LED strip along inside lower and back edges of the case, these also need control. Testing of the pump made me realise that you need control of it to purge out the air etc so some sort of switch control is required. Furtermore this will need to be done preferably without the motherboard, drives etc powered up as many start/stop cycles are required. I could just use a toggle switch or similar but I want this a bit fancier so might as well build something. 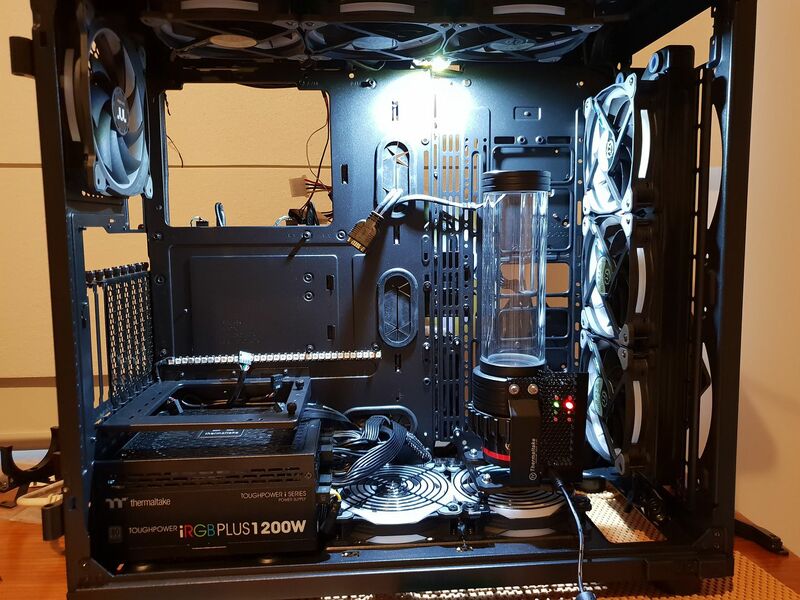 When working on the PC its always hard to see anything especially when everything is black on black. So a maintenance light to illuminate the entire case would be most excellent indeed. As I couldnt find anything like I wanted on ebay I built it instead, the above pics show the fruits of my labour with the 4 way logic switch board, pump mounted master switch panel and TT power distribution board. 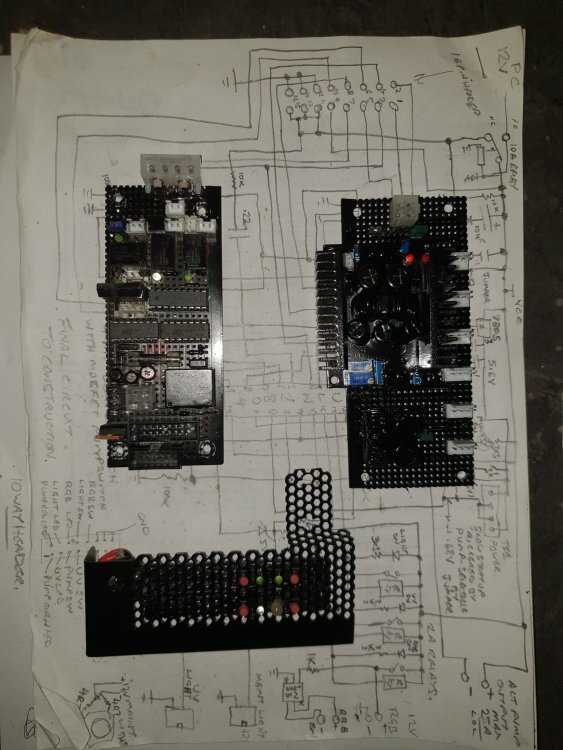 Discreet logic was used due to lazyness however a microprocessor such as PIC or arduino would be better. The switch panel also has a DC power connector to allow a 12V 4A or so power supply. 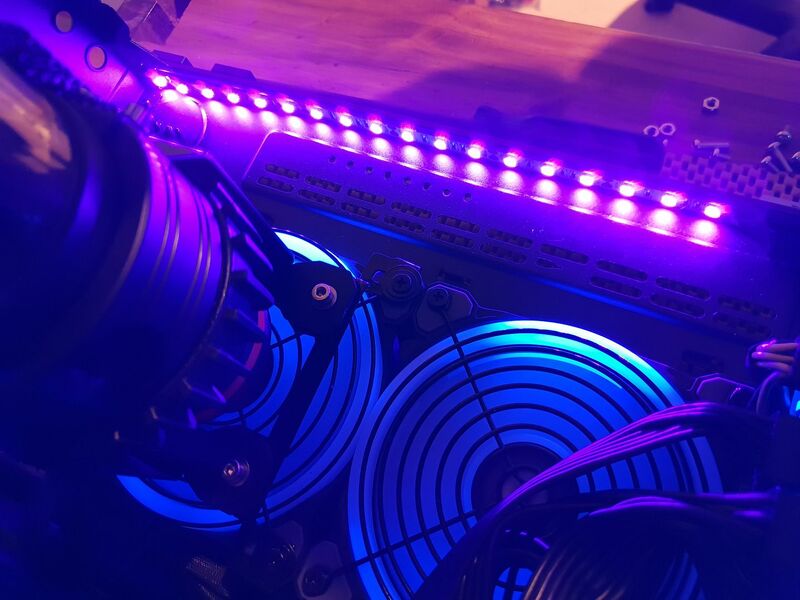 When plugged in the maintenance light comes on instantly and all other functions off, pump, light and UV can be operated in maintenance mode but not RGB as the maintenance 12V is isolated from the PC. In normal running mode the pump, UV and RGB are triggered but not the light. 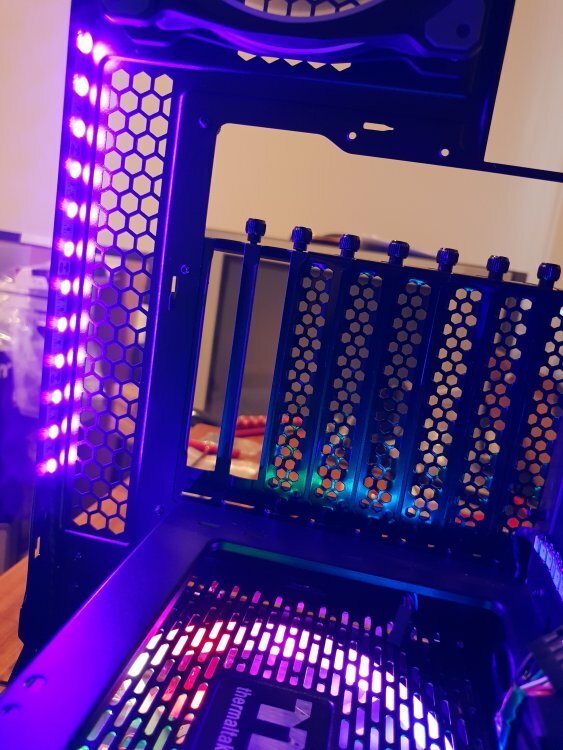 An additional switch board using blue illuminated tactile pushbutton switches will be made to install at the top front of the case to mimic the function of the internal master switch board. A 10 way header is already installed to the switch board for this provision. Very careful drilling required for that exercise. 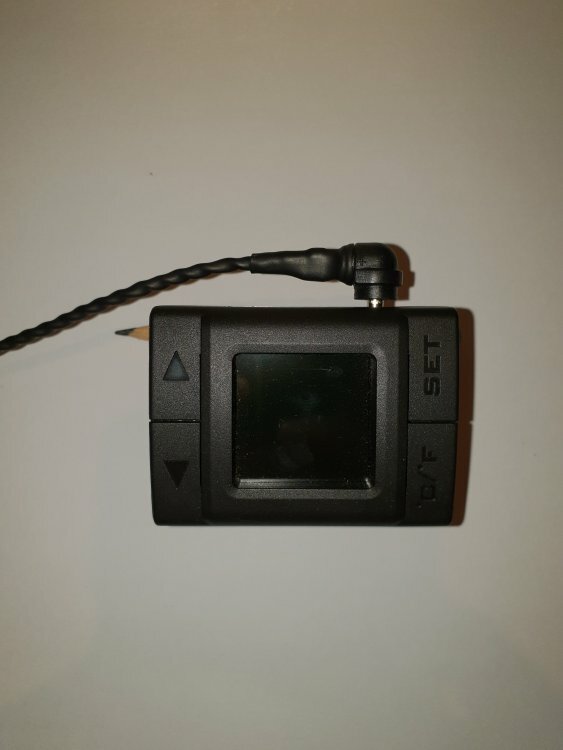 Edit: I did find something on ebay in the end, if someone wants to do something similar with a lot less work search for 4 channel touch switch. 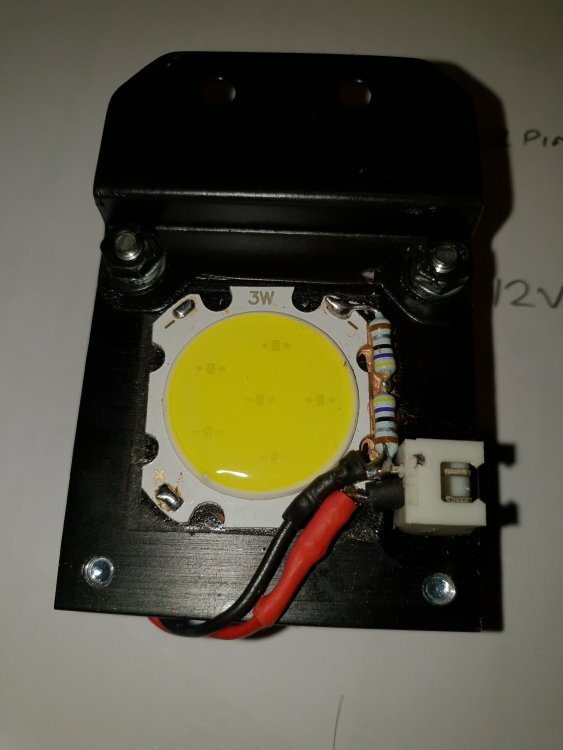 The power distribution board consists of a 300 watt buck converter from ebay with an additional output filter and 6 output headers. This will supply up to 6 TT controllers with 12V & 5V and up to 15A or so on the 5V rail all from the PCs 12V supply only. An enable header was added to allow opto coupled control from the switch board however without 5V the TT controllers run the fans at full speed so that could be a problem. Under full load the buck converter only gets warm. 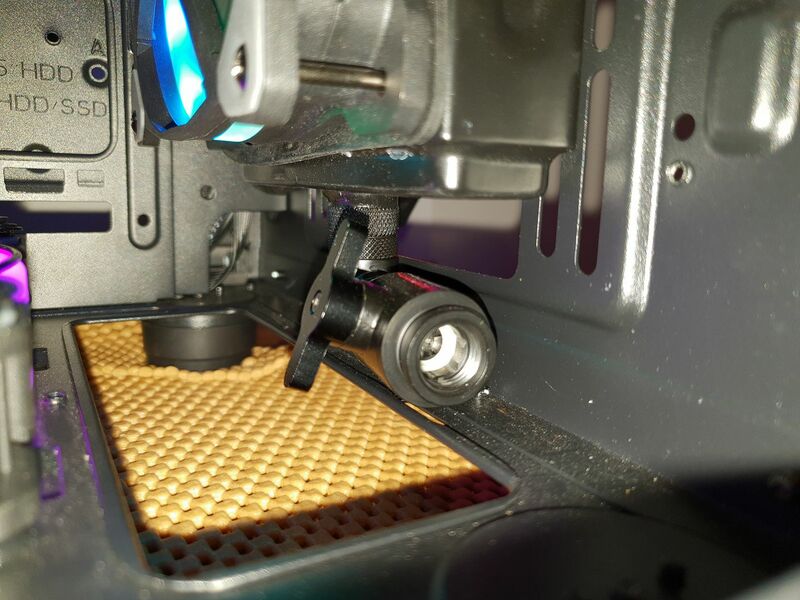 TT controllers mounted to 3rd hard drive bracket on standoffs as double sided tape wont cut it and surfaces are uneven. Leaving the covers off as the cute little boards are black and I like the exposed electronics on black look. This will provide up to 25 controllable ports for ARGB with the maximum capability of 30 if required. 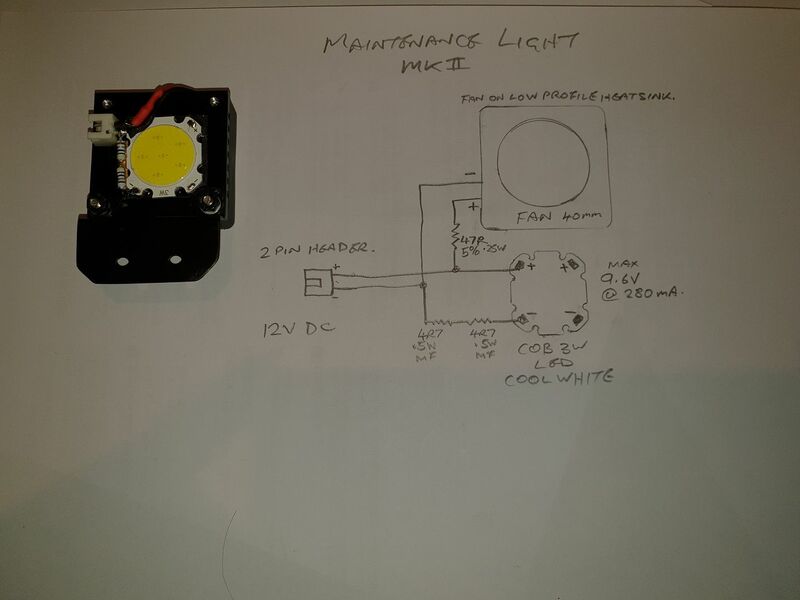 The maintenance light consists of nothing more than a 3W COB LED with 2x 4R7 resistors in series on 12V. 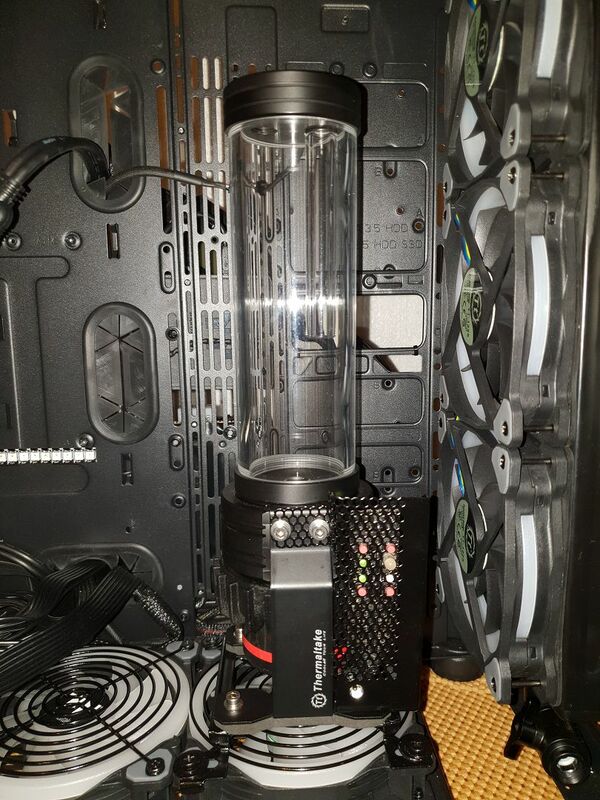 Works very well and lights up the whole case very well but gets very hot so I bolted it to a chipset heatsink and it seems fine without the fans running. 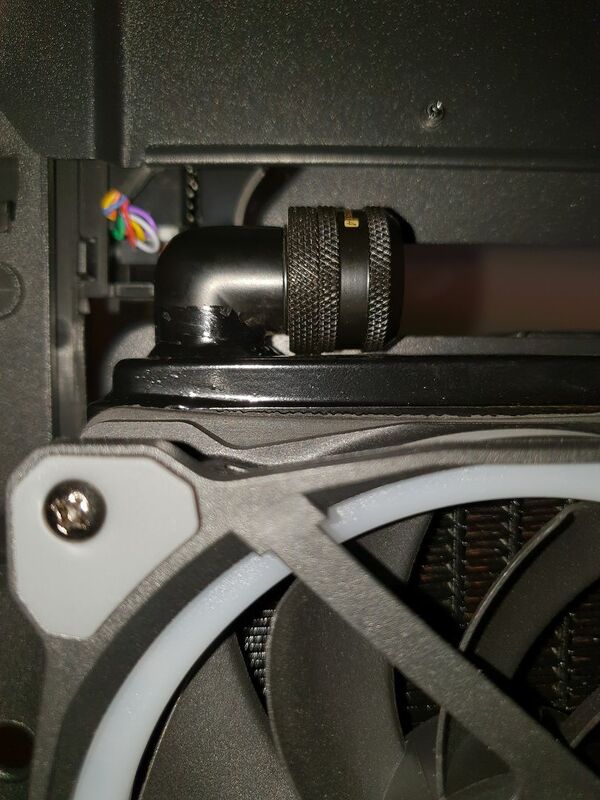 A small bracket I made tucks it up level with the radiator and prevents it blinding you. 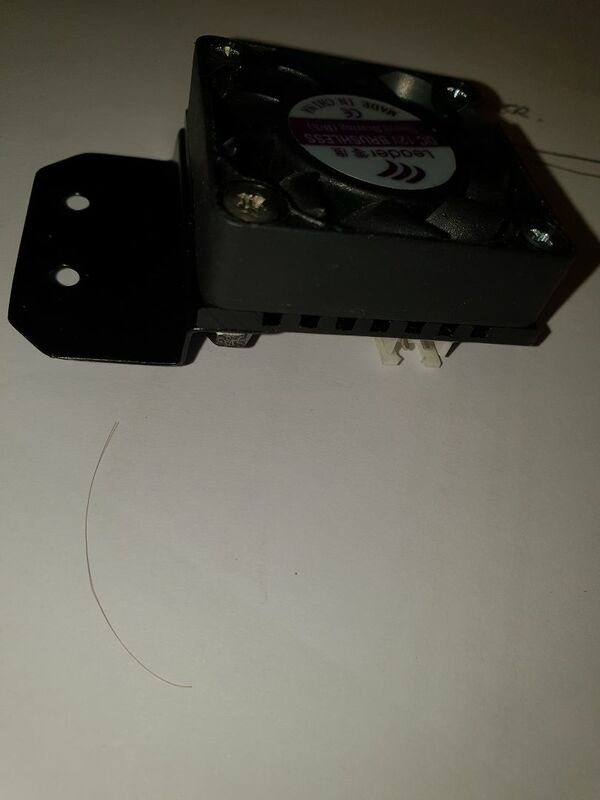 Found a small fan on a low profile heatsink, epoxyed a 2 pin header to the heatsink and slowed down the fan, works perfectly. LED is off center as the sticky pad already was there like that, small bead of compound under the resistors. 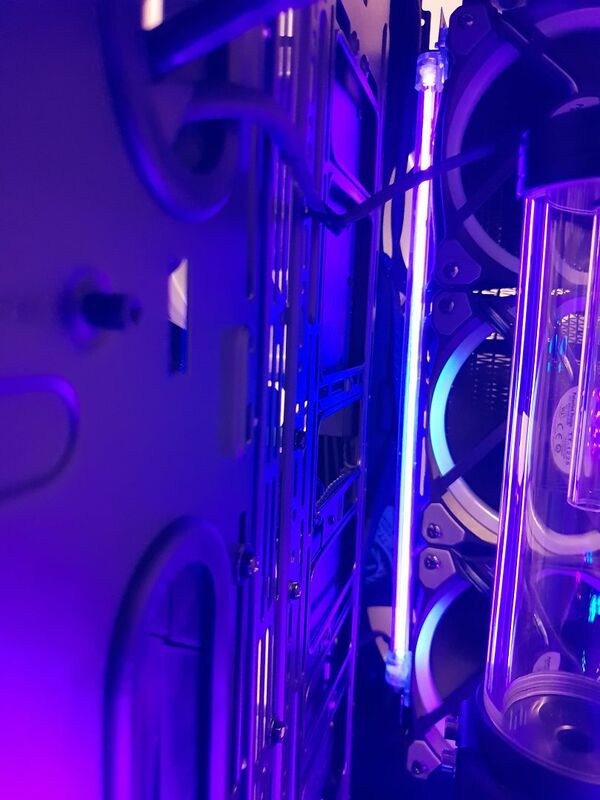 And here is the UV lighting as installed, will wait till coolant is flowing to see if more strips need to be added. UV Cold cathode behind radiator on more custom made and spray painted brackets....mixed feelings on this as I think UV LED strip is brighter but I bought it so in it goes. UV strips cut to length and wires with headers attached, strips stuck to cut lengths of magnetic fridge magnet (thanks to the real estate agents who put fridge magnet calendars in the letter box. Edit: Pointing up seemed better, lucky I used the magnets. 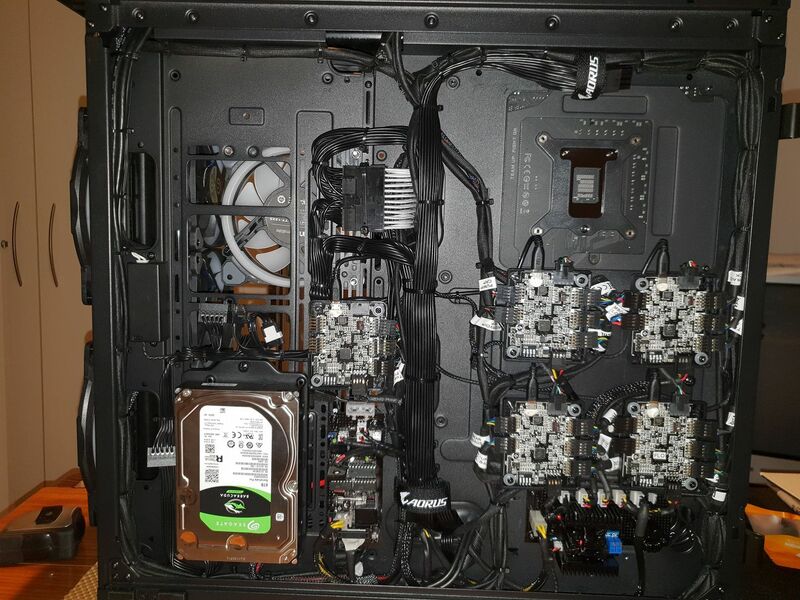 Ok now its starting to look better, strip above power supply will be covered by the motherboard and the motherboard front strip is between the motherboard back plate and PCB. 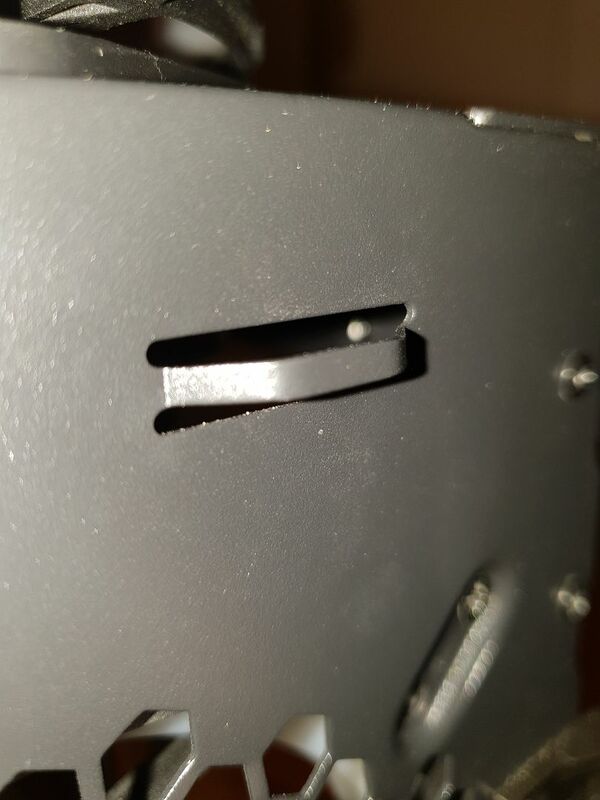 Pump is on a custom bracket I made from part of the case that fell out when I touched it above the front radiator. Lower Trio fans required grilles I nicked off old power supplies and sprayed black, got sick of fishing out dropped screws out of them. By the way you go through a lot of spray paint by the time you have sprayed boards, brackets, screws, washers, standoffs and even plug shells. Becomes a bit of an obsession....but it must be black! 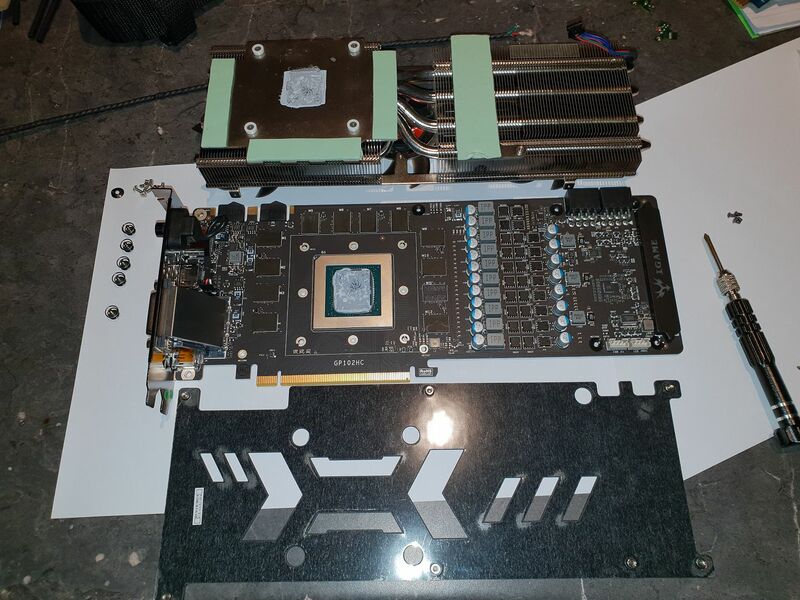 Didnt like the TT cpu blocks, sorry TT, and got 2 blocks for the same price as an EK block. This is the Barrow block after I increased the number of LEDs but before polishing. This is the Barrow block after polishing. I followed this guide here and he is spot on, you can get the acrylic polish at auto or hardware stores. 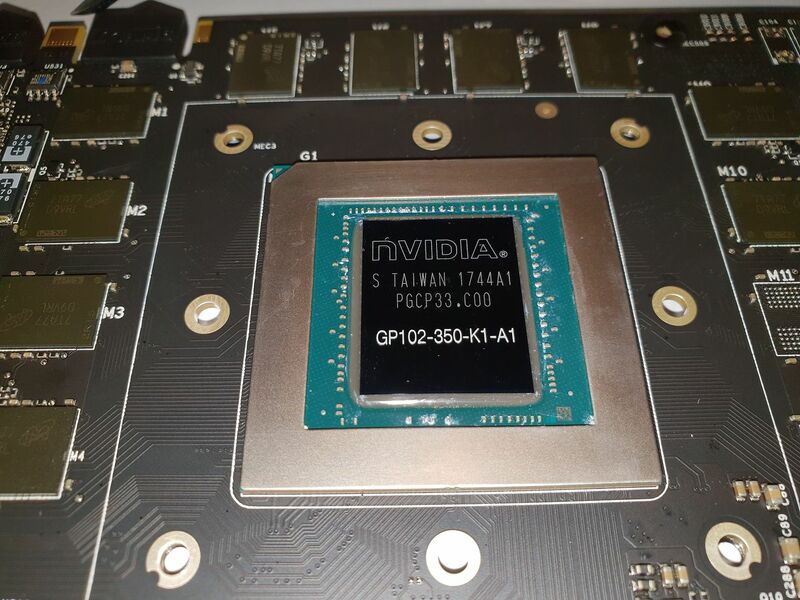 This block has now been bolted to the motherboard/processor with Thermal Grizzly Conductonaut liquidmetal compound, seen used in Linus tech tips vids. Has to be the craziest compound Ive ever used, strange almost spooky liquid metal stuff. Considerations, comments and suggestions are all welcomed as I'm flying by the seat of my pants here. 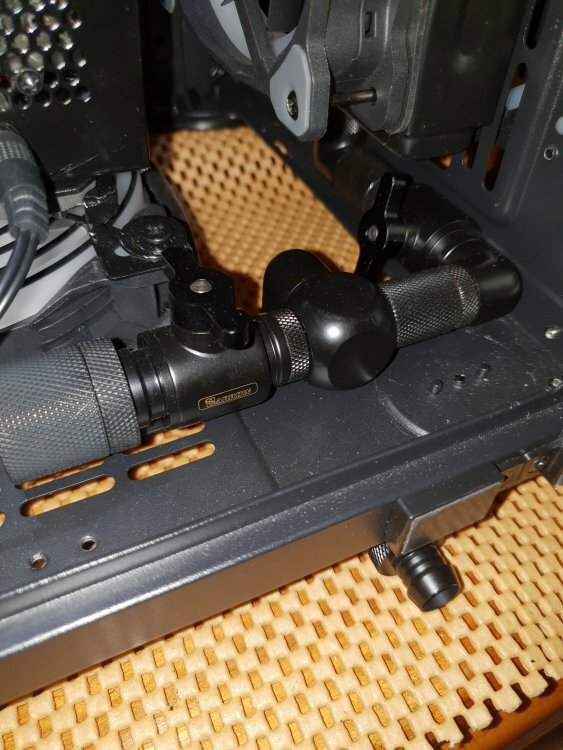 After a lot of research I decided that the D5 pump had all the grunt I should need and the Pacific PR22-D5 Plus﻿ pump suited my needs perfectly. D5 pumps aren't cheap so a single loop will do for my first WC project but it will be a long one. 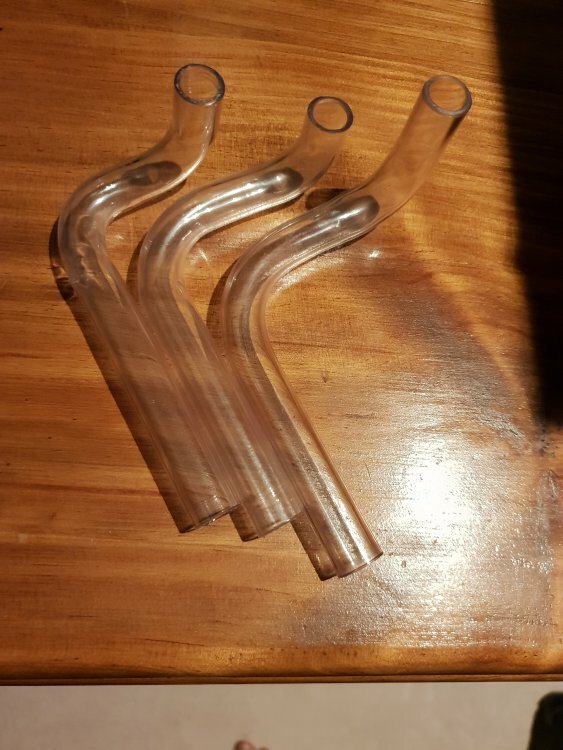 Decided on two 360x25mm copper core brass tank radiators from ebay, at AUD$56 each.....bargain! Edit: While getting them from ebay as I wanted to mod them suited my needs I wouldnt recommend it. The overall quality of the radiators isnt bad but be prepared for an excessive flushing experience. Had flushed and vinegar washed them then set them up to run on the bench with the pump. 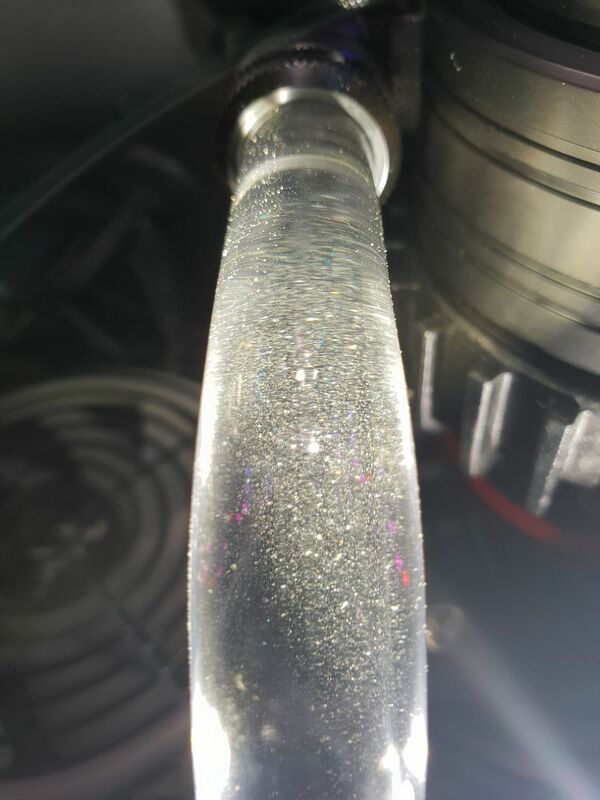 Next day pump was full of microscopic shiny specs, which I can only assume was oxides, looked like a snow globe. Ive had to pressure wash litres of water through them to clean them out so unless your getting creative get good quality EK or Alphacool radiators. One will be on the inside top the other on the inside front both in push pull fan configuration. The top radiator really needs a vent or bleed to remove the air for easy filling and the front radiator needs a bottom port for draining. The TT TF1 flow meter is to be powered from a dedicated header/5V supply on the switch board. This output features delayed startup and shuts off with the pump in maintenance mode only (selectable). 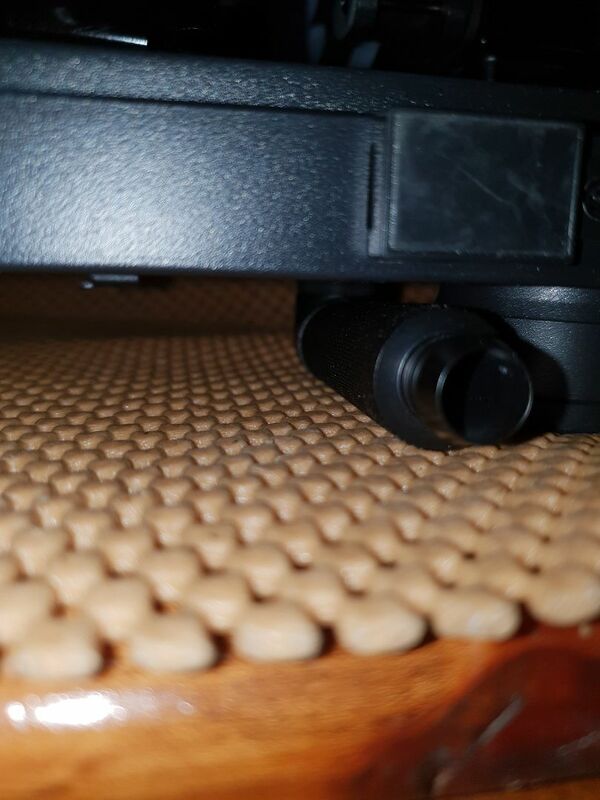 By grinding the paint from sections of the tanks and fittings and carefully drilling holes in the tanks of the radiators I was able to solder the fittings to the tanks easily with a small blowtorch. As they are both brass the solder created a very strong and water tight bond. The use of pure core solder with water dissolving flux made the removal of the flux after very easy. Here is the front drain with tap fitted. Here is the top radiator bleed. Space is tight so I bonded a female to female right angle straight onto the tank.....worked perfectly. 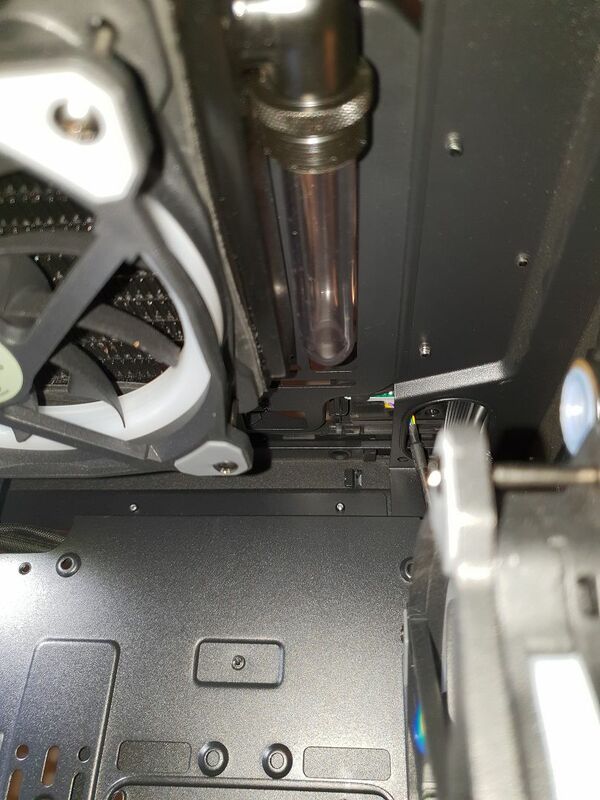 Plan is to bring 16mm PETG tube across and up through this slot to get it above the radiator then U turn it and maybe pop out the side of the case with a bleed valve. Thought this might be a good place to practice bending, if I can bend this the rest should be easy. Bit dodgy on the end but I can easily redo it later and Ive learnt a few things like dont pull out the bending rod till you know its good cos you wont get it back through the bend. Probably a good time to mention fittings. 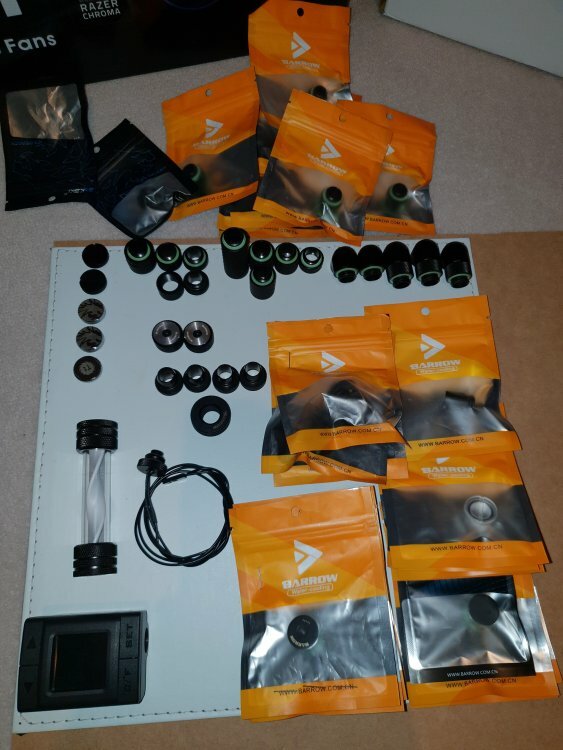 Your going to need more than you think as things will change as the build progresses or so Ive found. 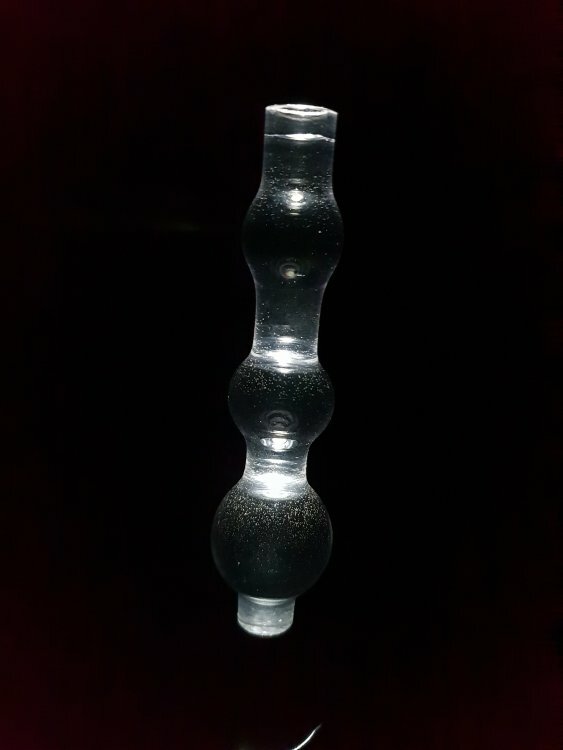 Seems there is another obsession that can happen here as there are so many different types and they are so very well made. Because your not completely sure what you need I found Ive ended up with alot of fittings, joiners, extenders, elbows, rotatable elbows, end caps...and on it goes. 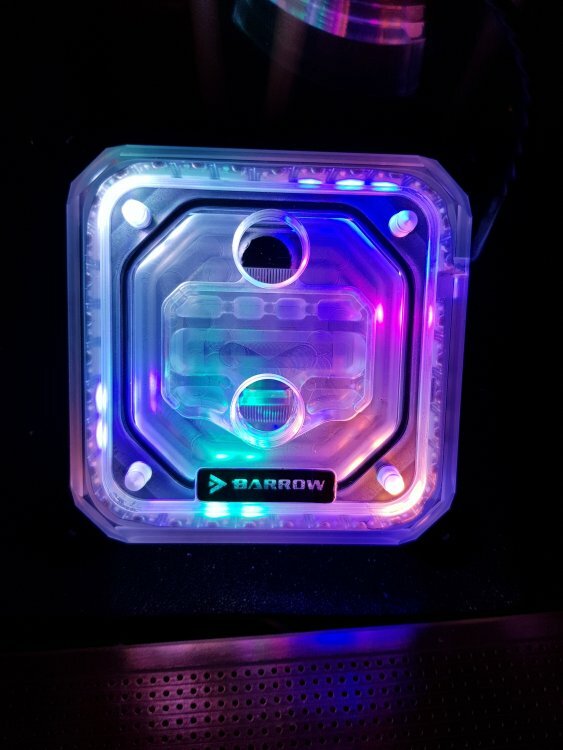 The quality of the Barrow fittings is excellent and about a third of the price of EK fittings. All Bykski and Barrow fittings were sourced from mydiyau for local Aussie stock or ins_mqzje for direct from China. Having a bit of a go at TT here. Had to make a custom power lead for the TF1 not just because I am running it from a custom header but also because the lead supplied is terrible. 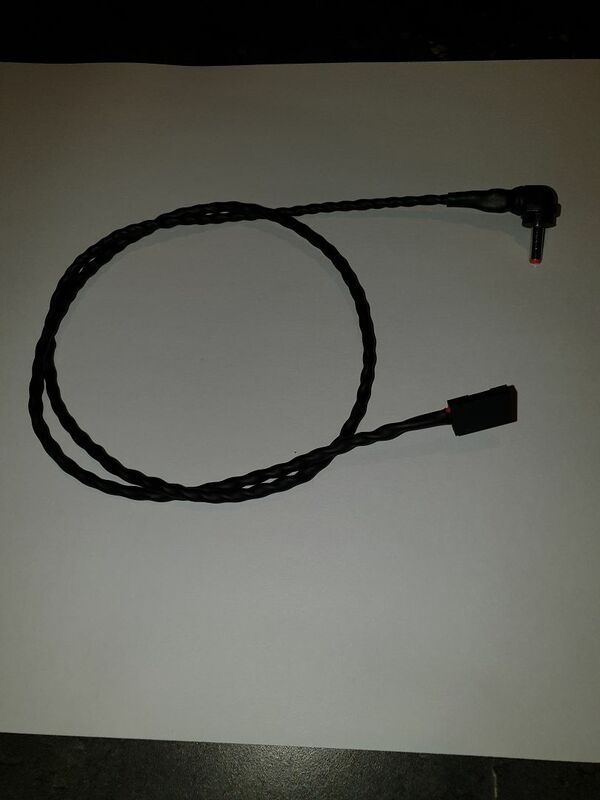 Here is the lead supplied with massive straightplug. Keep in mind here that the objective is to hide as much cabling as possible. 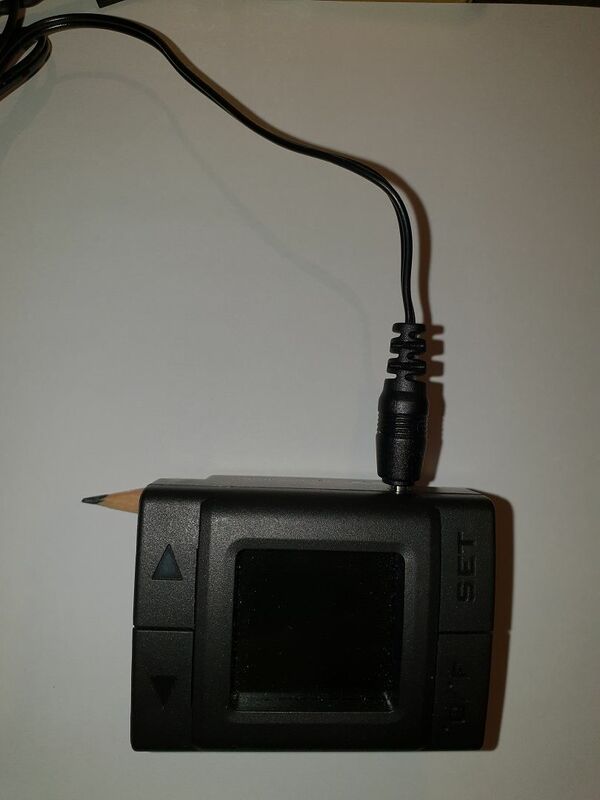 Here it is with my neat right angle plug and heatshrunk cable...much better. As all the fans etc from TT come with expanding or silicon sheath I would expect the TF1 to also. While I'm having a go at TT I found this also. 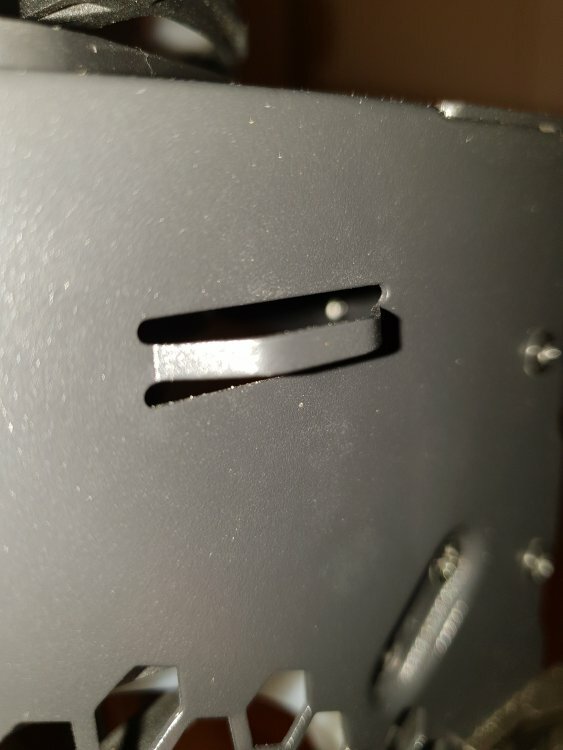 Had to replace the mounting bolts for the power supply as 2 of the threads stripped out on first use, screws supplied where cheese metal also and totally useless. So far not impressed with this power supply for the money, the flat unbraided lead set supplied is cheap and nasty, but luckily black. 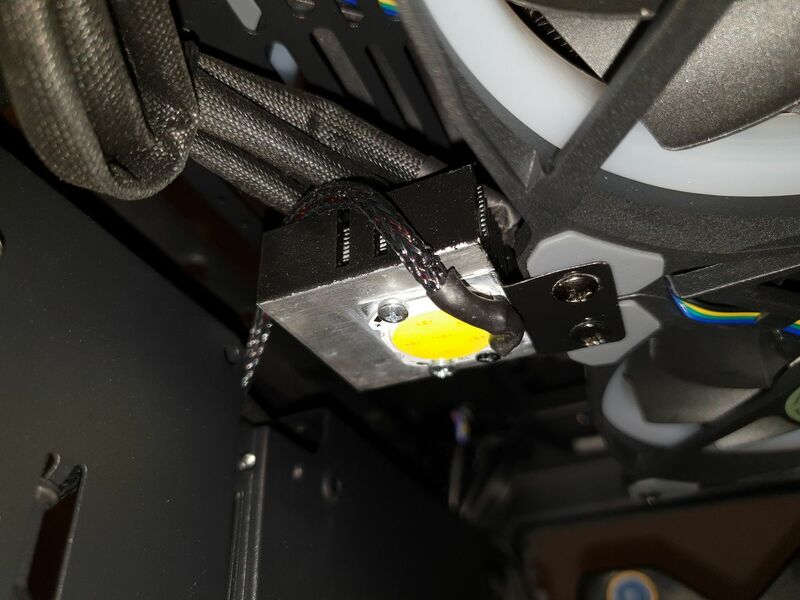 Also the 8pin motherboard power leads supplied are not long enough to get to the motherboard headers at the top of the case, they fall short by 150mm or so. 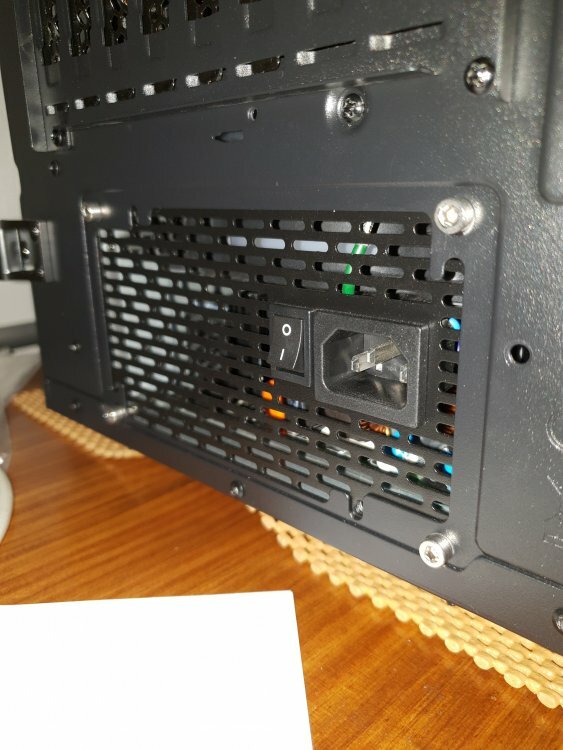 This is a TT power supply in a TT case....they should reach should they not. Still waiting for extension leads from ebay that I shouldn't have to buy which I then have to sheath as they are yellow and black. The USB connection is a mini USB all others are micro USB. Lead supplied used both USB ports on a motherboard header. This meant I had to combine 2 lead sets to make a mini & micro USB to motherboard header lead. 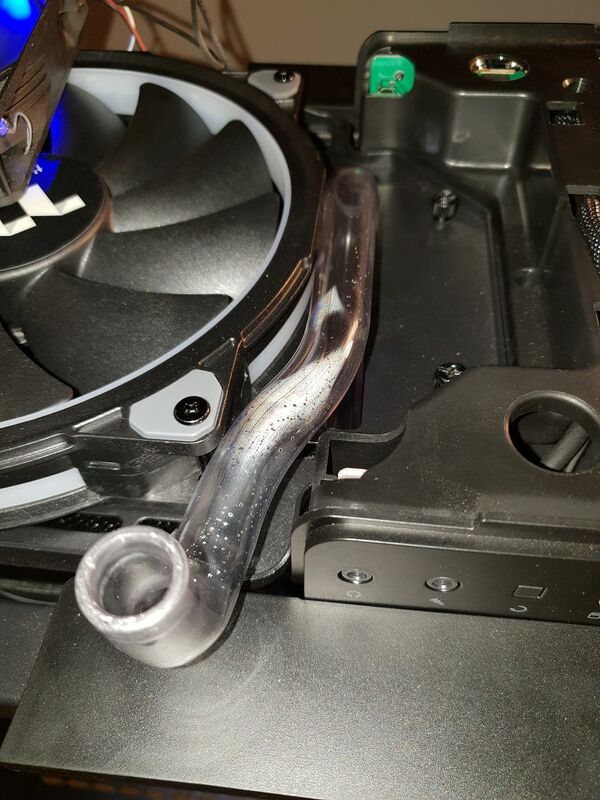 This keeps the 2nd motherboard header free for actual USB ports. All 4 holes drilled and tapped to M4 with M4 stainless steel screws fitted, looks better too. 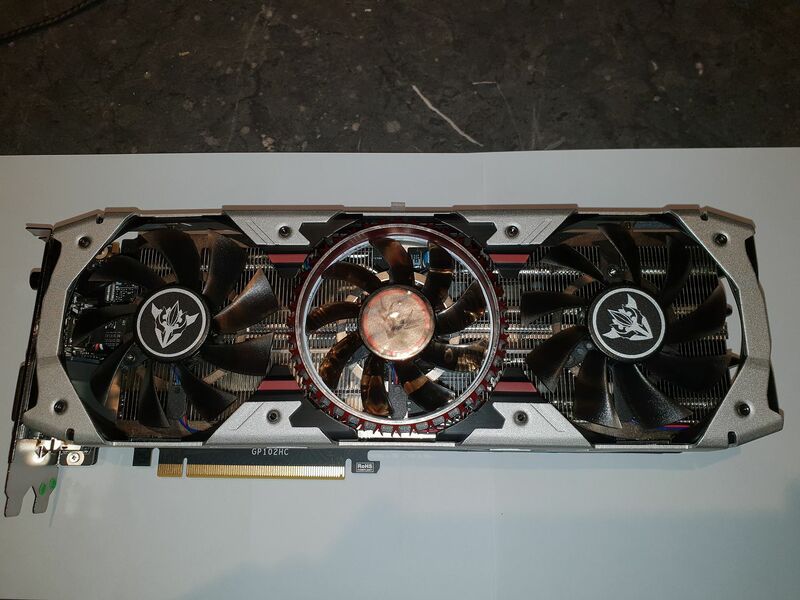 Colorful igame GTX1080Ti Vulcan AD card I picked up for less than $1000 in the great GTX1080Ti clearance of late 2018, I almost missed out. 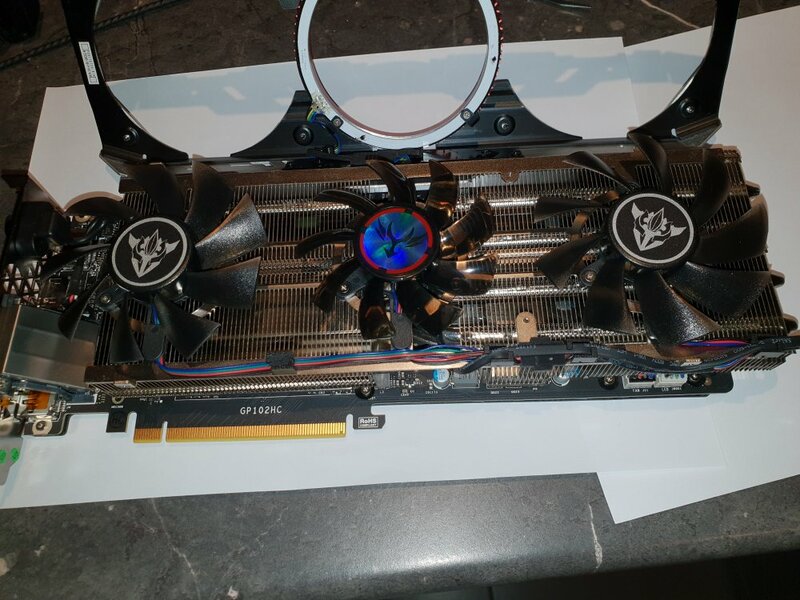 I had a feeling the 2080 would be a lot dearer and not much better than a 1080Ti which turned out to be correct. 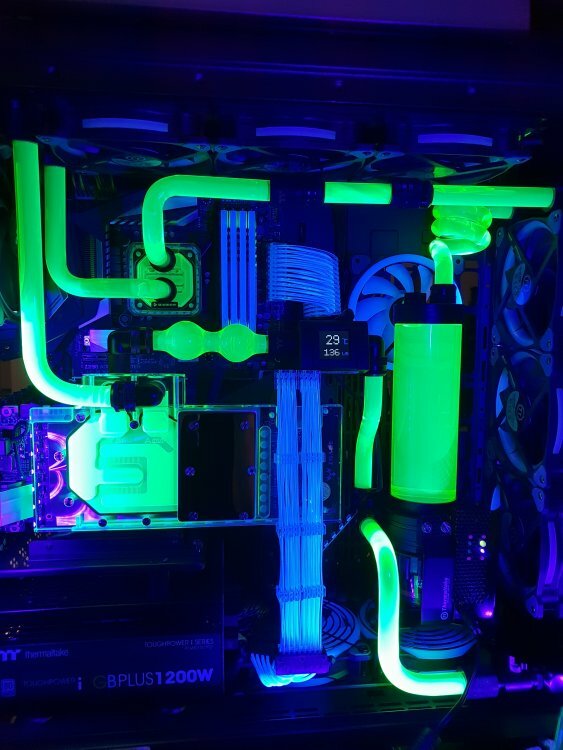 Hard to even find a 1080Ti now. Well there goes the warranty, doubt it would have been useful anyway. And we are in, excessive amounts of horrible rubbery compound everywhere. 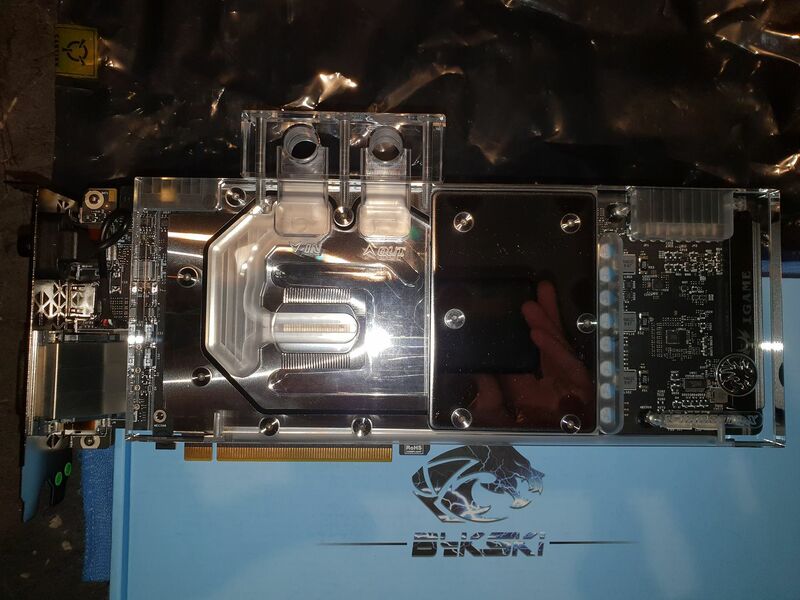 Bykski GPU block fitted with liquid metal, probably overkill but thats the theme here. Bykski was the only block available for this card. Quality is good although I would like to sand and polish the machine marks out of it but dont want to pull it apart yet. They seem to have blocks for every card out there. I gave the block as much of a polish as I could, looks great. Considerations, ﻿comments and suggestions are all welcome﻿d as ﻿I'm flying by﻿﻿﻿ the seat of my pants here. As can be seen there has been progress. 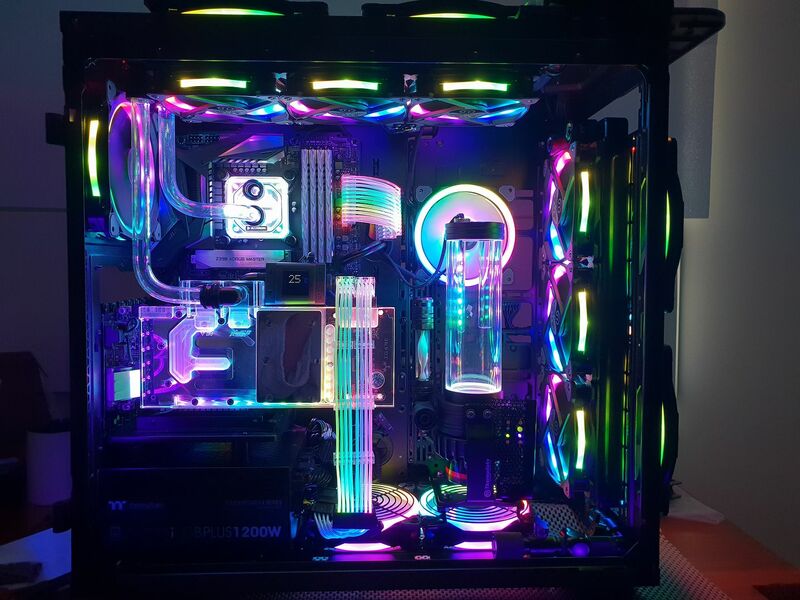 RGB levels have reached insanity which is what I was going for. 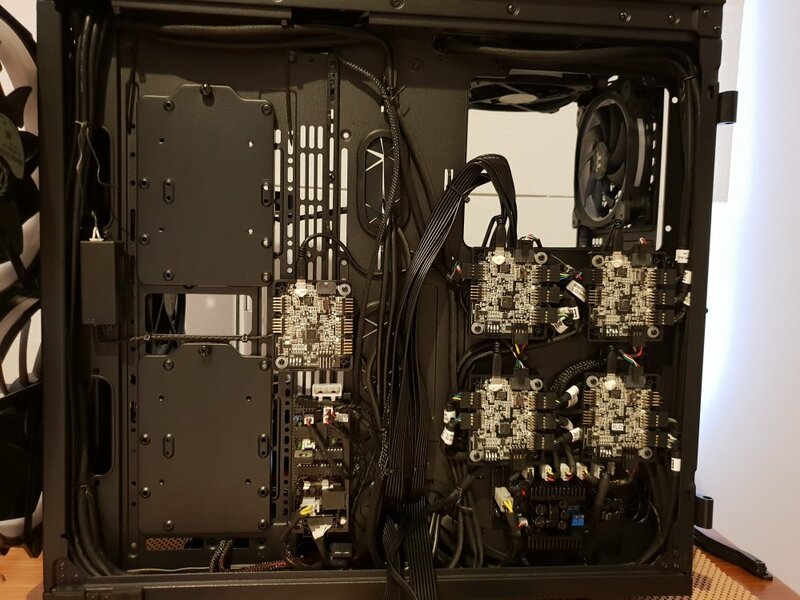 Motherboard is now fitted with CPU and block, Strimmer's fitted (they are a real pain to route) and GPU on block mounted to riser cable and mounts. 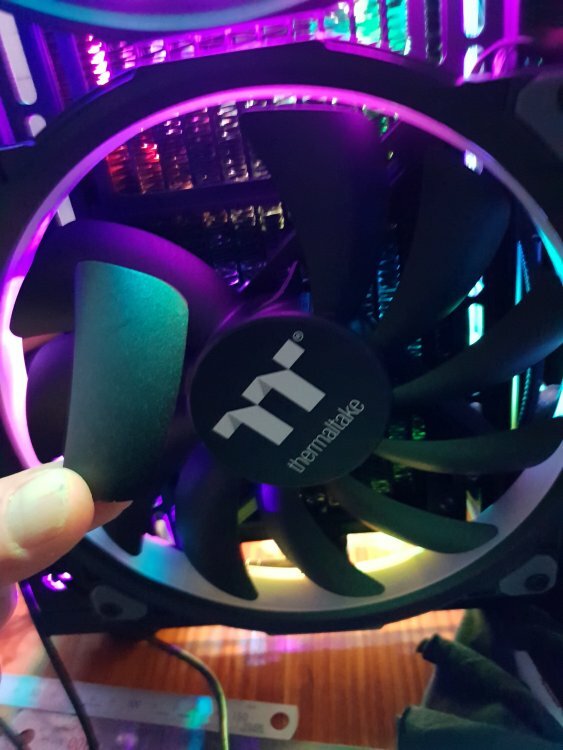 A spare trio fan was added to the back for additional air output. Running it off a test power supply (which is screaming under the load LOL) as there is no cooling yet so no MB lighting just yet. Plumbing started but need more fittings and need to make a better bending jig. Here Ive combined the drain outputs from the pump and front radiator with taps and fittings to provide one output for draining, might be why I ran out of fittings. 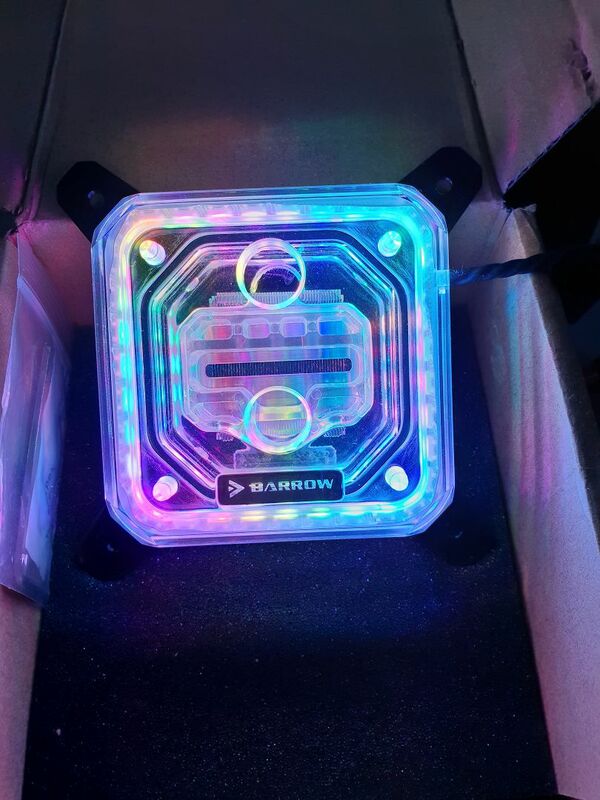 Its been brought out under the case on a rotating elbow so there will be no water drips in the case. Shiny new Seagate Barracuda Pro 6TB for game storage but there is a problem. On the left is a generic WD HDD showing the mountings as per 99% of all HDDs out there. On the right is the new Seagate. 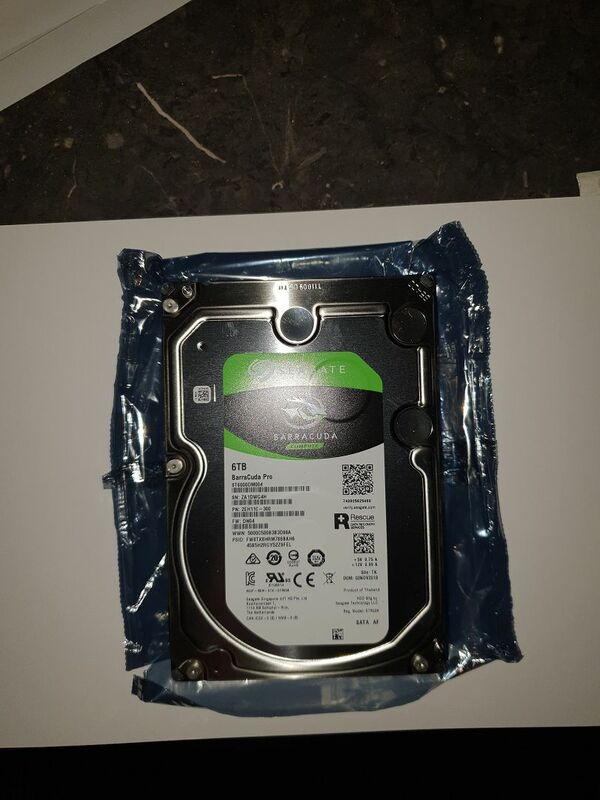 This had me wondering for a bit....thought I had one to many beers as I had checked this with spare HDDs. 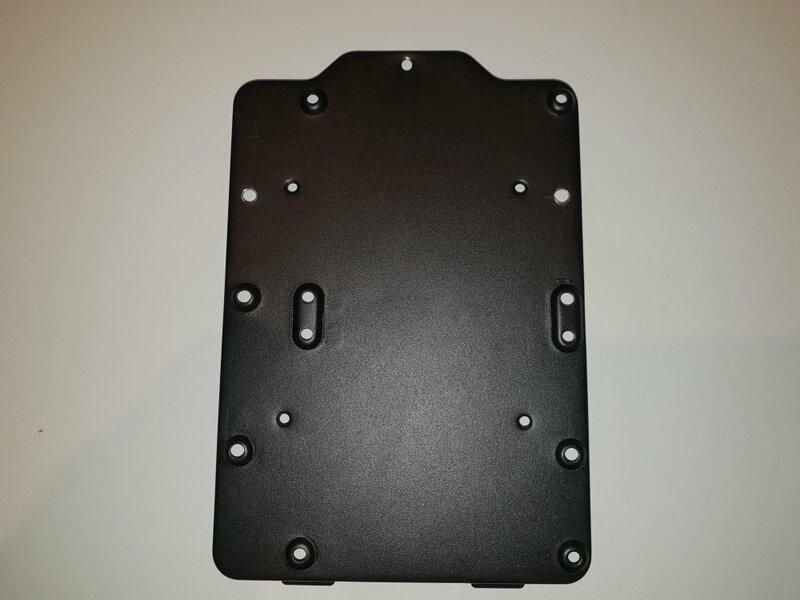 Now why Seagate decided to use a 76mm spacing I cant say but not one of the many HDDs I have exhibit this mounting except a WD Black which has both mountings. 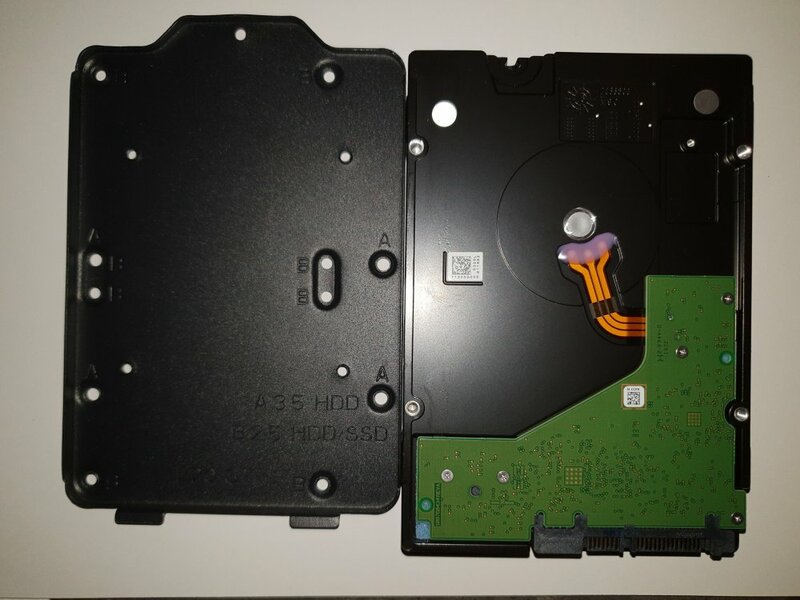 As can be seen there is not a chance of it fitting to the TT HDD bracket, cant blame TT for this I should of got another WD Black. 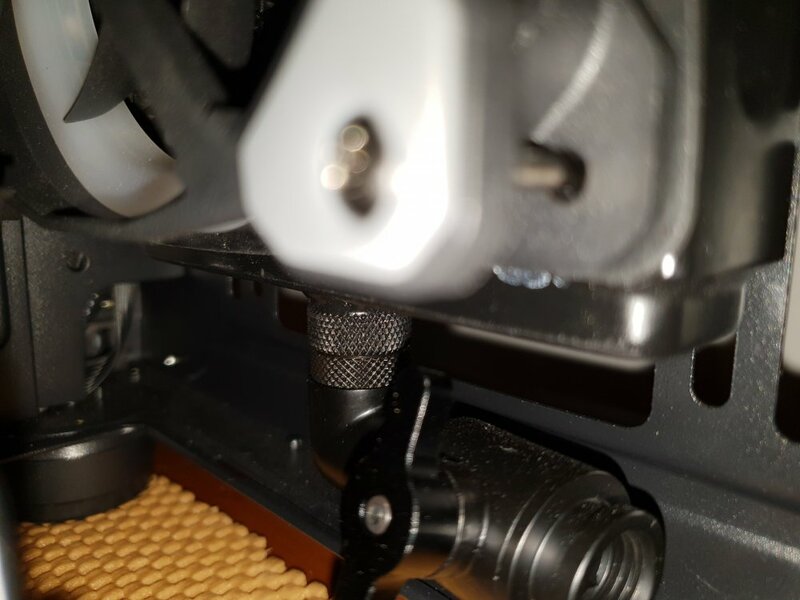 Either way TT need to provide another 2 x A holes (LOL) to the bracket to accommodate this new mounting standard. Bracket with 2 new A holes, screws get packed with 3x 3mm washers to match the other pressed standoffs. 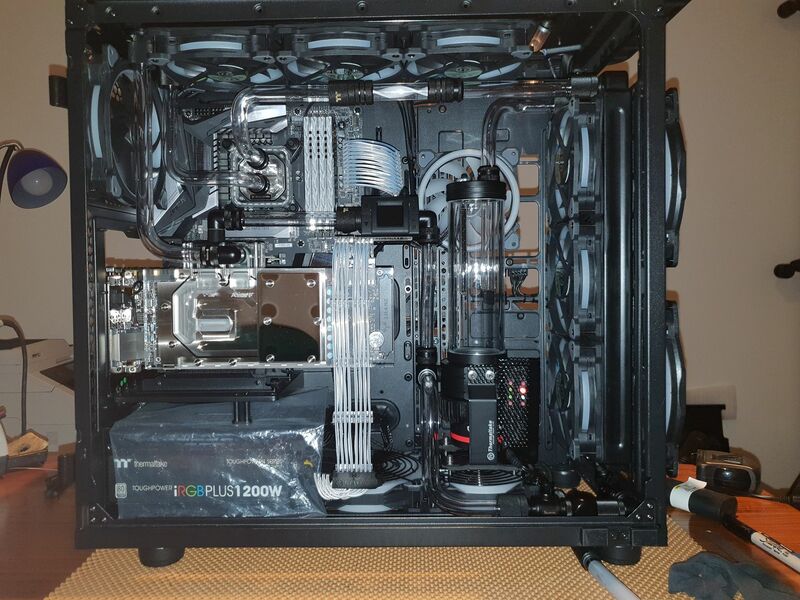 Rear cabling and looming is complete (except for the MB 8 pin power extensions. Would of preferred to have used Velcro ties but with the huge amount of cable and lack of fixing points meant cable ties were the only option. In fact along the top and sides there are no decent loom mounts, just a few holes here and there. Most of the loom is held in place by its shape after it was cable tied. TT need to add a whole bunch of these to allow Velcro strap/ties to be used. While there are a few on the main backplate there is nowhere near enough. More fixing points please TT! 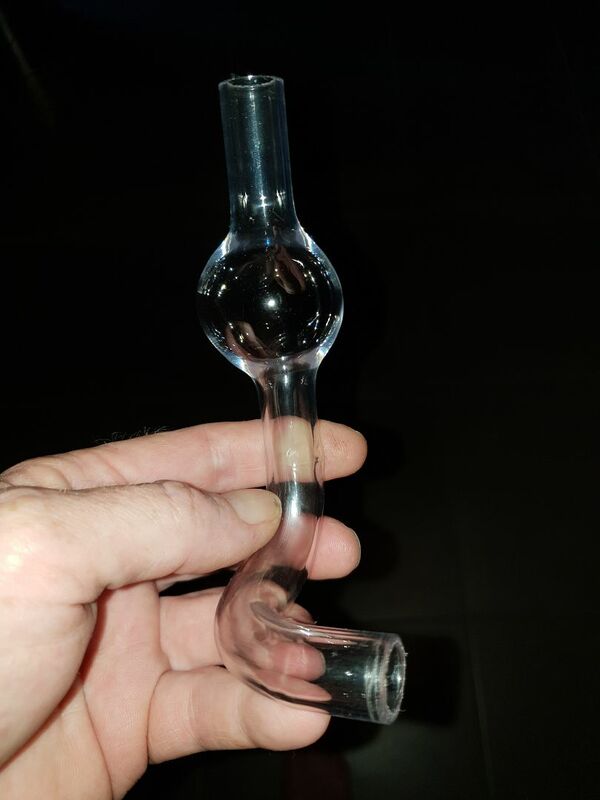 Plumbing completed, still need to redo the very first pipe, the breather at the top. Was a bit trickier than I thought and you get better as you go. 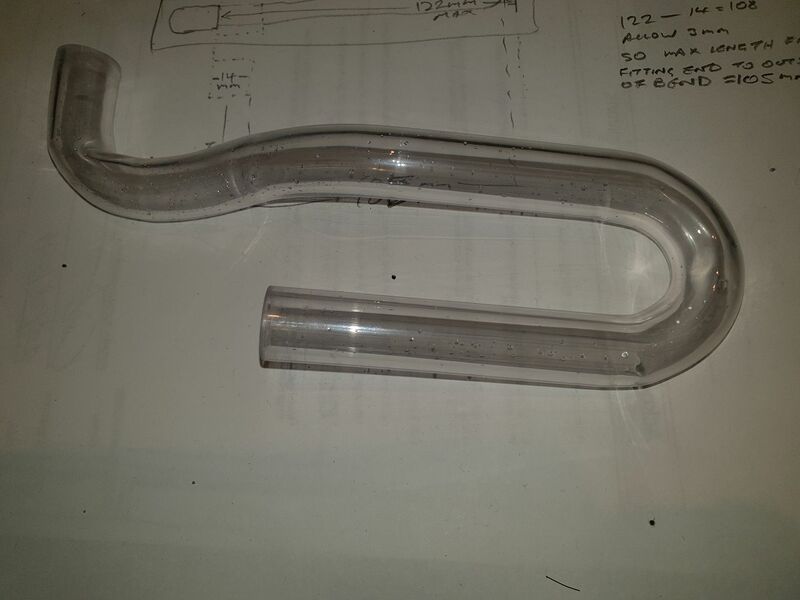 Found the plastic mandrils for bending tube totally useless, the 90 degree one wasnt even 90 degree. 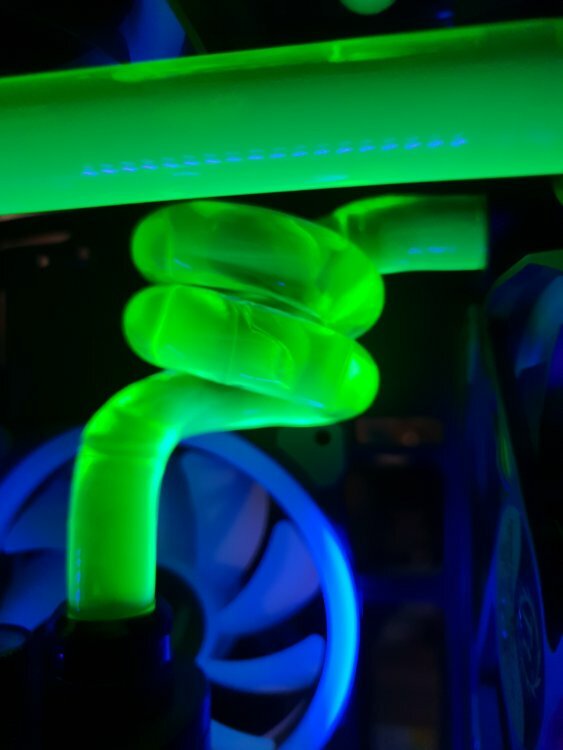 Got some of the best bends free hand. Only jig I used was a piece of board with lots of lines drawn on it, a square, rulers, several blocks of wood, small pieces of conduit to bend around and clamps. 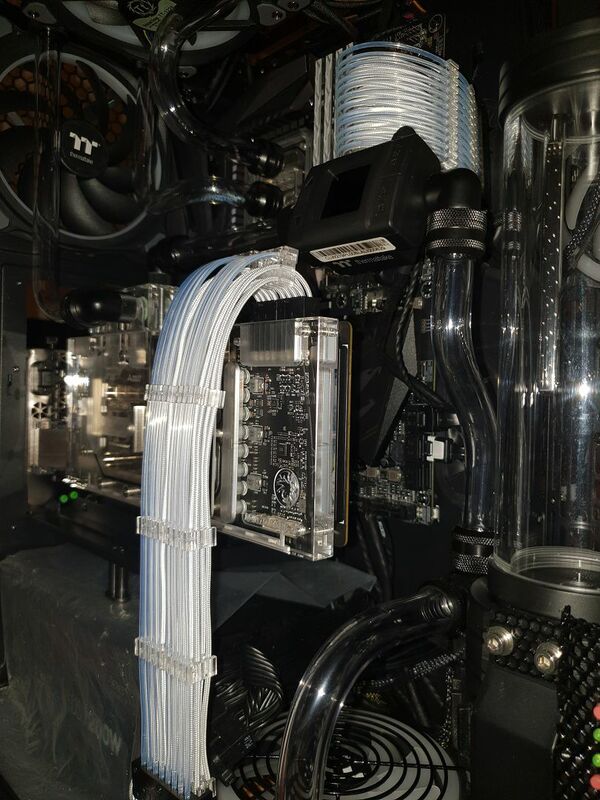 The majority of it I'm happy with and with only a total of 6 pieces of 16mm PETG tubing. Of course there would of been less used if it wasnt for the mistakes. I dont like replying to my own post as it feels like Im talking to myself and I do that enough as it is but its the only easy way to manage this blog. 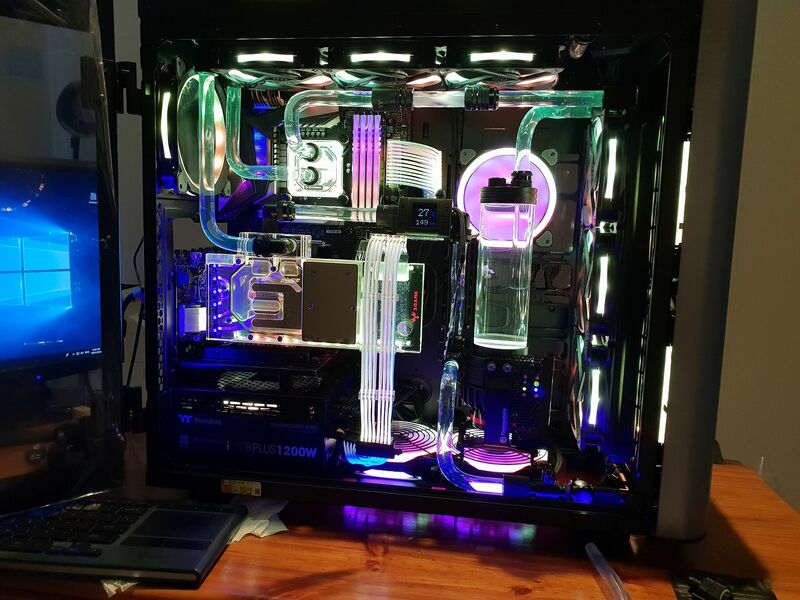 Well its now most of a water cooled PC, bit to go yet. Best part of all not one leak inside the case, only 1 incident underneath with a loose extension creating a slow desk flood but other than that all good. 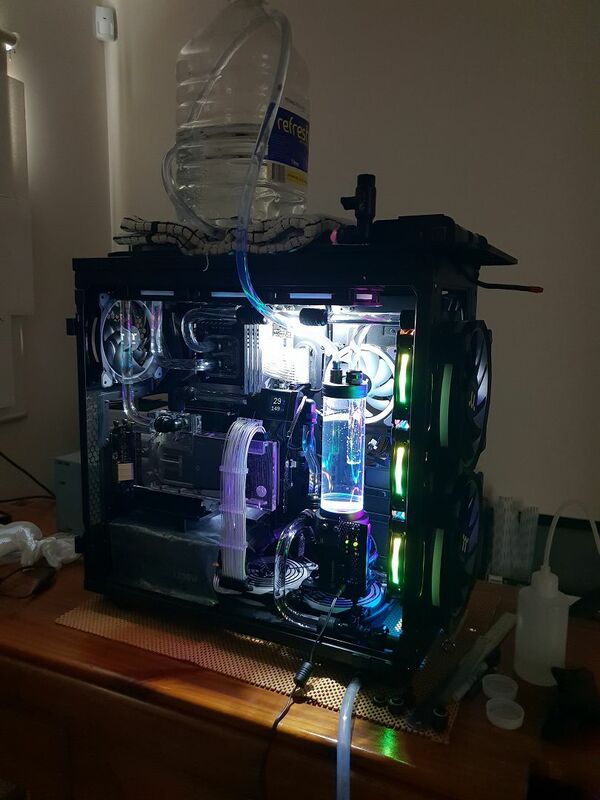 System filled with distilled water and has run for 2 days....but its not that easy, never is. 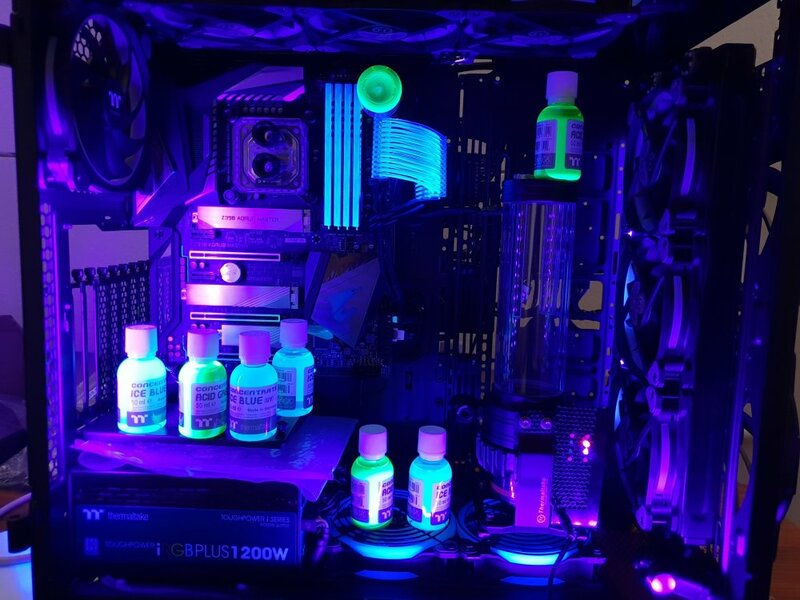 Had to run a set of fans as the pump and its RGB lights kept increasing the water temp. 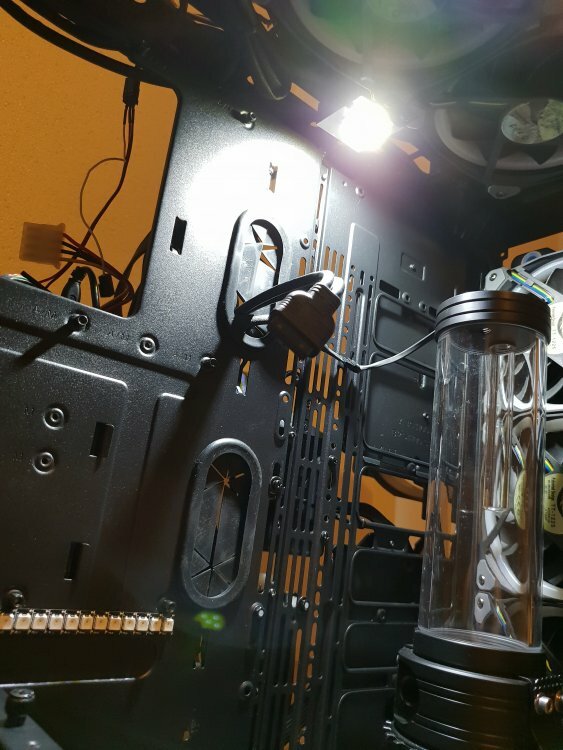 There is something to keep in mind the RGB lights in blocks, reservoirs and fittings all output heat and quite a bit of it to. This will add to your thermal load increasing your water temp and needs to be allowed for in your radiator and fan choices. My flushing setup....basically a 5 litre reservoir extension to allow continuous active flushing of the system. This setup worked perfectly allowing me to even detach, refill and reconnect the bottle without adding any air to the system. Output drained at a trickle into another bottle below. 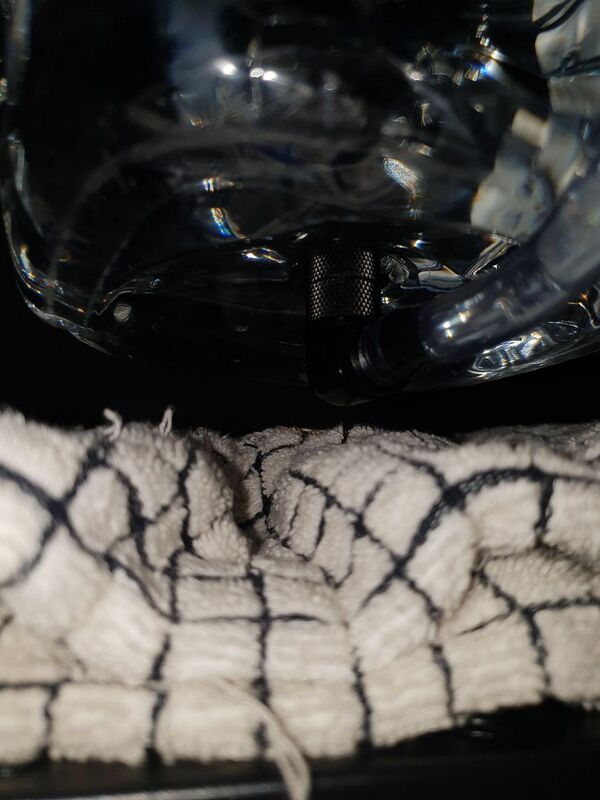 Fittings screwed on a spare distilled water bottle. And here is why....more of the microscopic shiny snow globe stuff and heaps of it. I was able to even filter this stuff out onto paper towel and run the water back through the system again. In the end I actively flushed over 20 litres through the system slowly over a long time to remove all the particles. If it keeps on coming I will replace the offending radiator. Dont buy cheap ones its not worth the time consuming flush process and its hit and miss to get a good one. 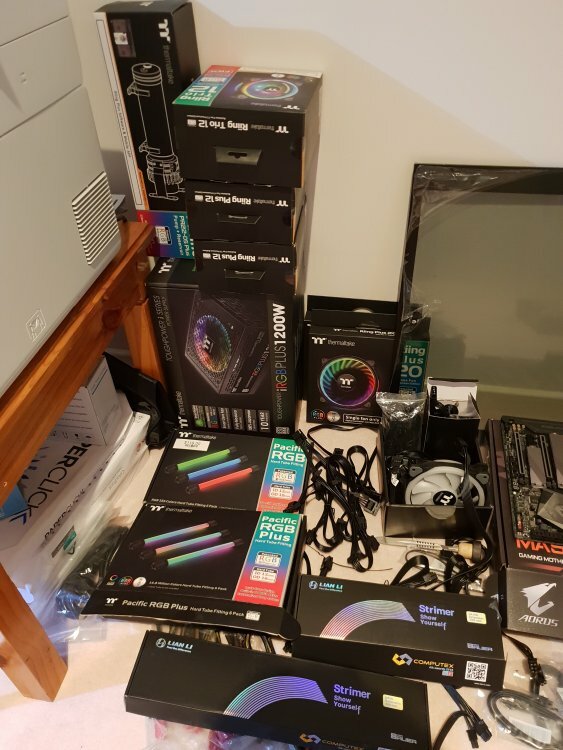 Now to actually set up the computer side of this build. 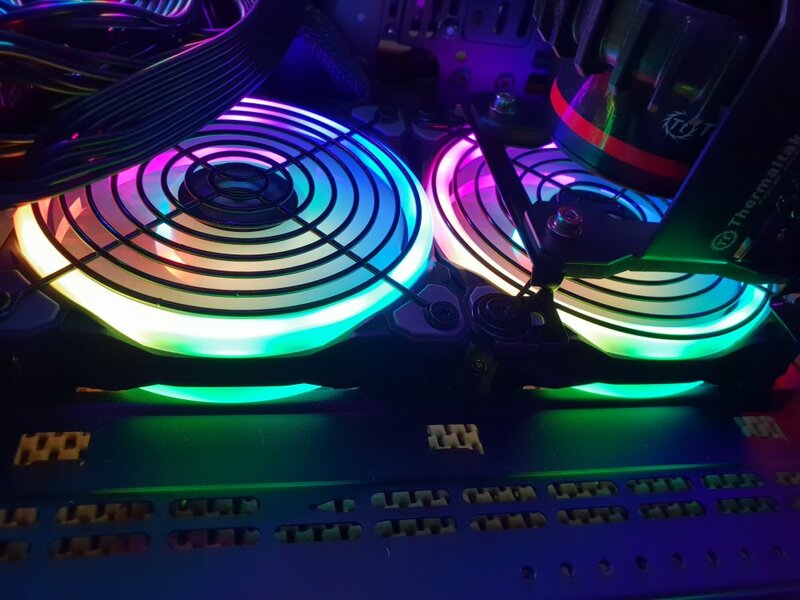 The Riing 20 fans are huge and as such I advise caution around them when they are spinning. The arm of my glasses got to close with this being the result, excessive cursing followed for several minutes. The fan blade plastic is a bit on the porous or brittle side but luckily accepts superglue. Looks really good with all of the RGB synchronized, pics taken in flow mode, MB strips are offline as I need to do some power tweaks. 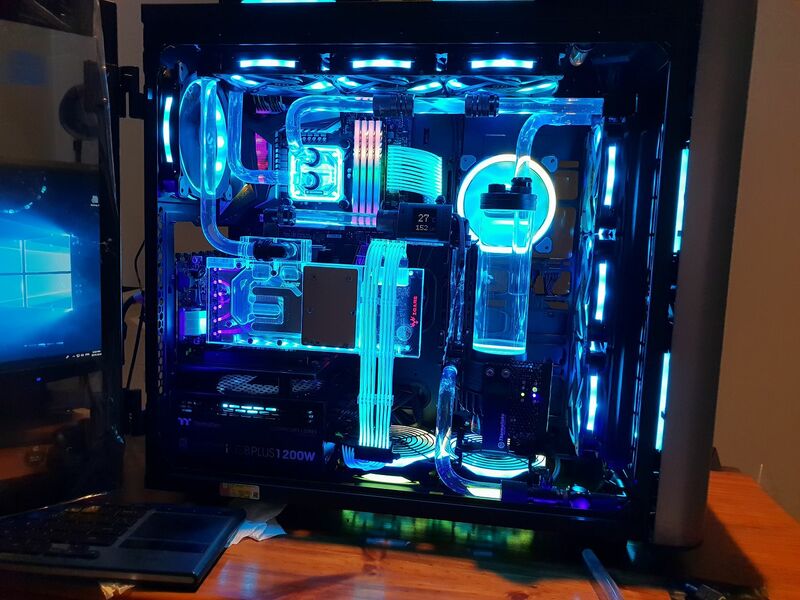 Motherboard RGB not synced and not sure if I can. 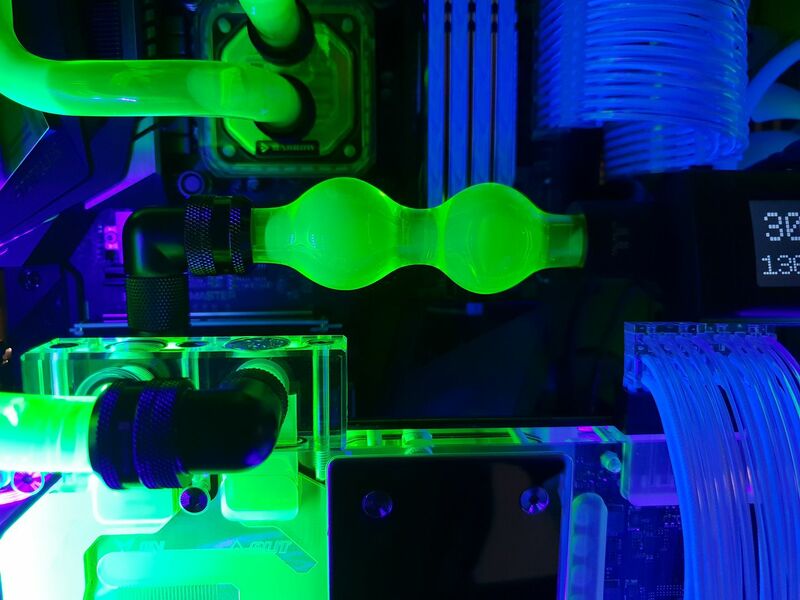 Flow rate is acceptable, I think. Lots of issues with USB hub errors and software crashes, most of which is sorted now and a lot of it due to power issues. The amount of power consumed by the RGB is insane with the buck converter no longer just warm and needing a small fan. Initial tests with the DPS G software showed an approximate increase of 7A on the 12V rail. Excluding the pump load gives approx 60W or 5V 12A or so after the buck converter. The MB strips take another 5V 1.6A or so . 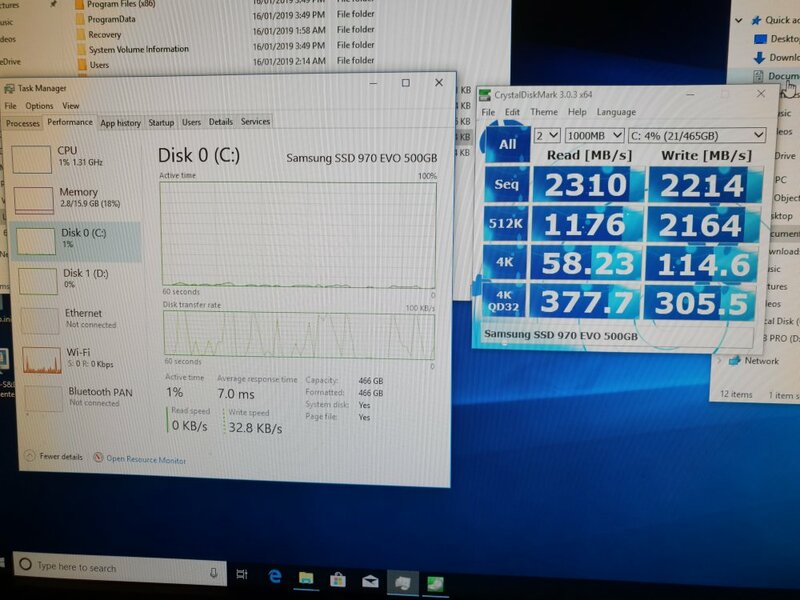 Win10 installation was very quick and after initial driver setup and whitelisting grabbed my copy of Crystal disk mark ran a test and sat there with my mouth open for some time staring at the result. I knew the Samsung Evo would be fast but was not expecting just how fast, all I can say is wow. A lot easier than I thought it would be and surprisingly a lot stronger too. Pressing on the ball is just like a coke bottle and it pops back out again. The outcome is quite good as each ball has a magnification effect. After playing around for a while ended up with this. Couldnt help myself, could be better. The TT Acid Green UV concentrate really pops with the UV but the Ice Blue concentrate not so much. Took over 5 liters of distilled water to clear it all out...nasty stuff. So back to clear plain distilled water, for now. Here is a short video on the operation of the maintenance mode.